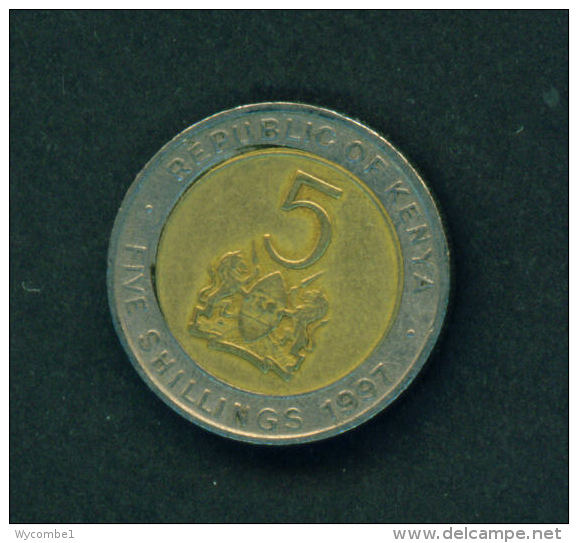 KENYA 1995 FIVE SHILLINGS ARAP MOI USED COIN Bi-metallic Brass center in Copper-nickel ring..
KENYA 1997 TEN SHILLINGS ARAP MOI USED COIN. 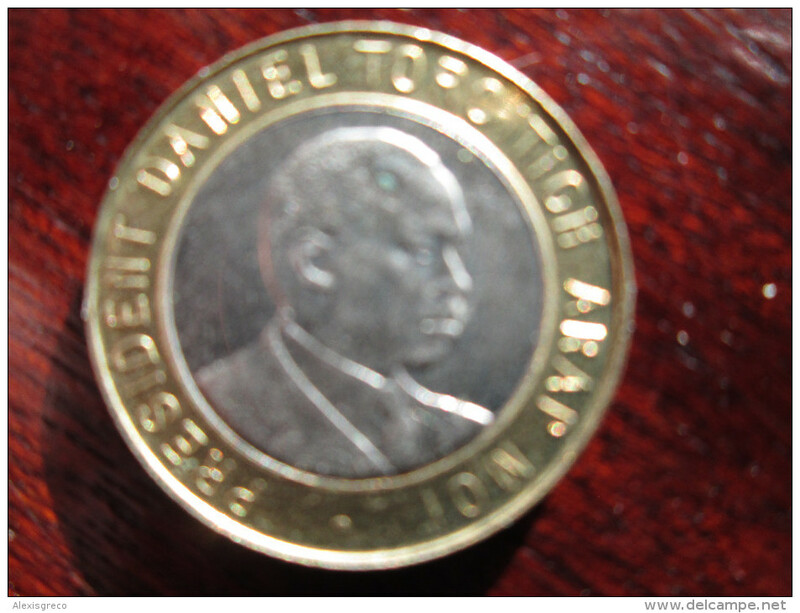 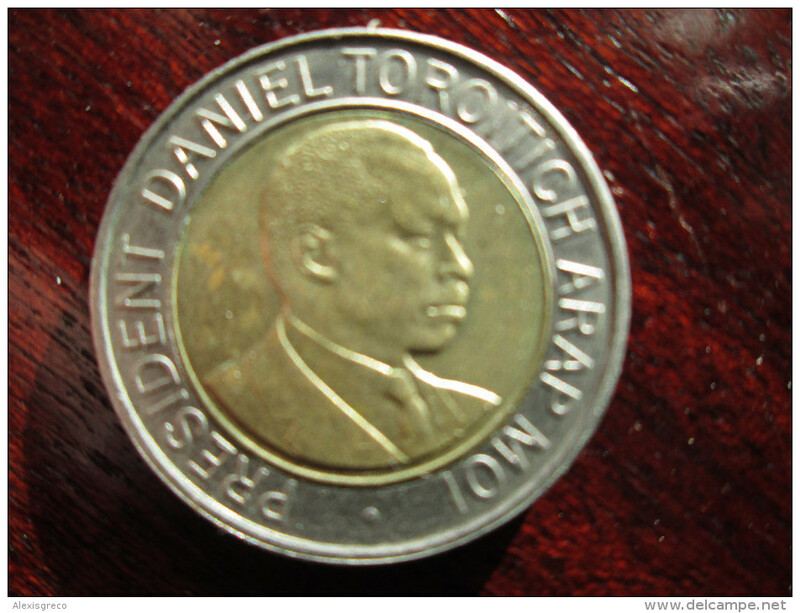 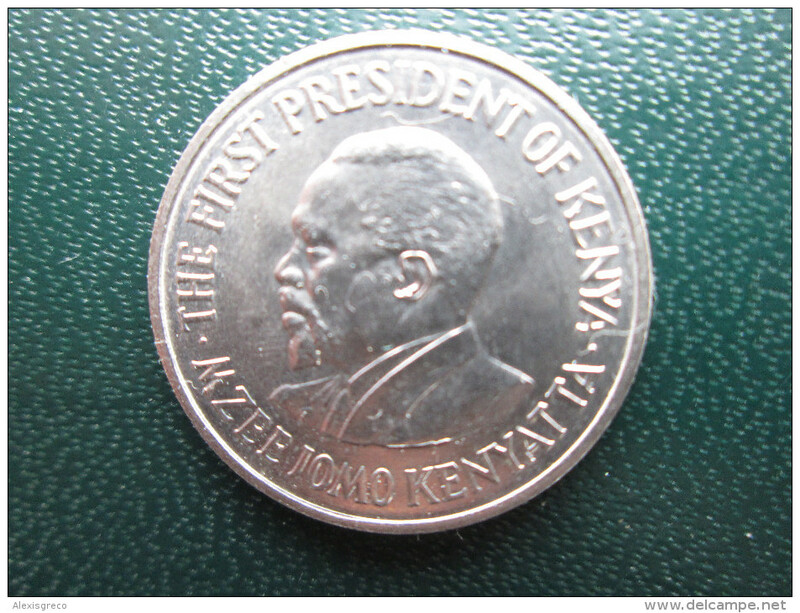 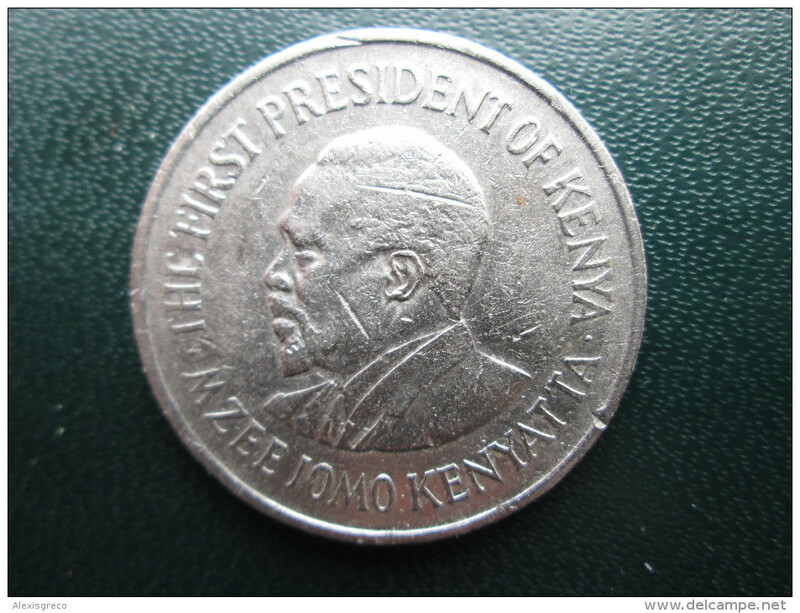 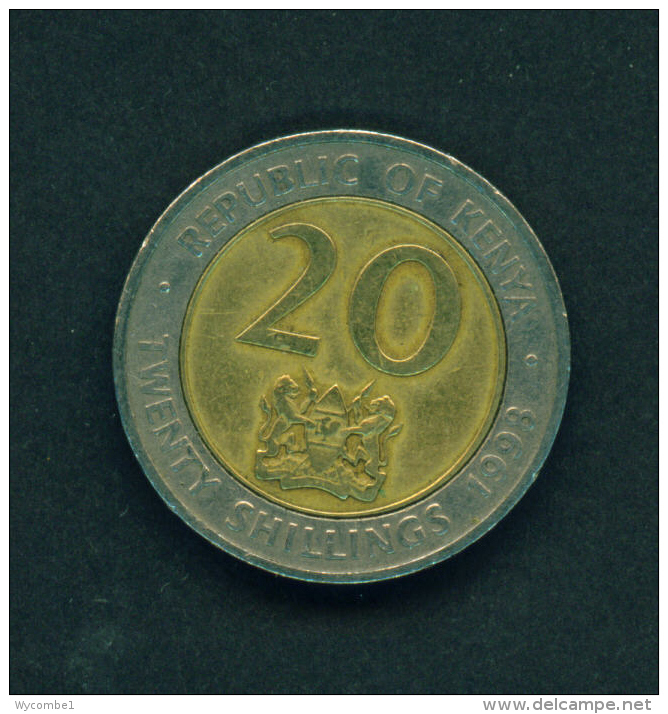 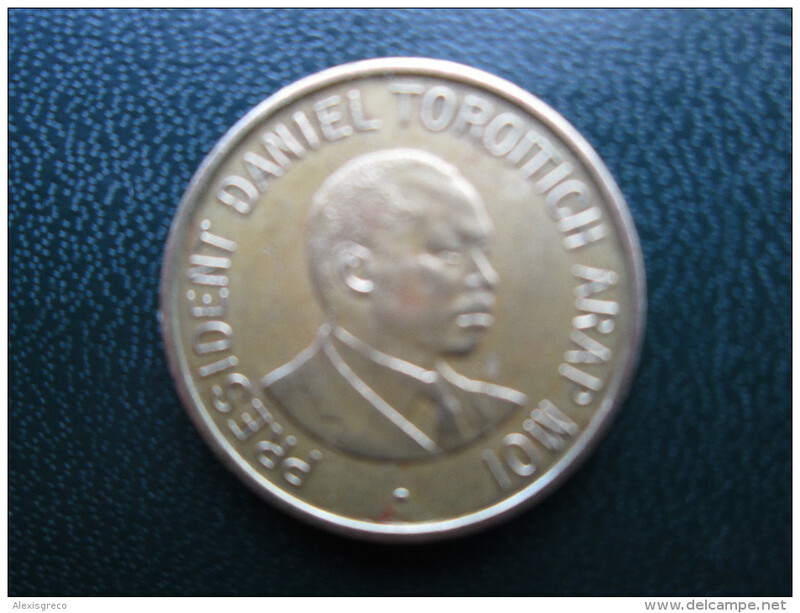 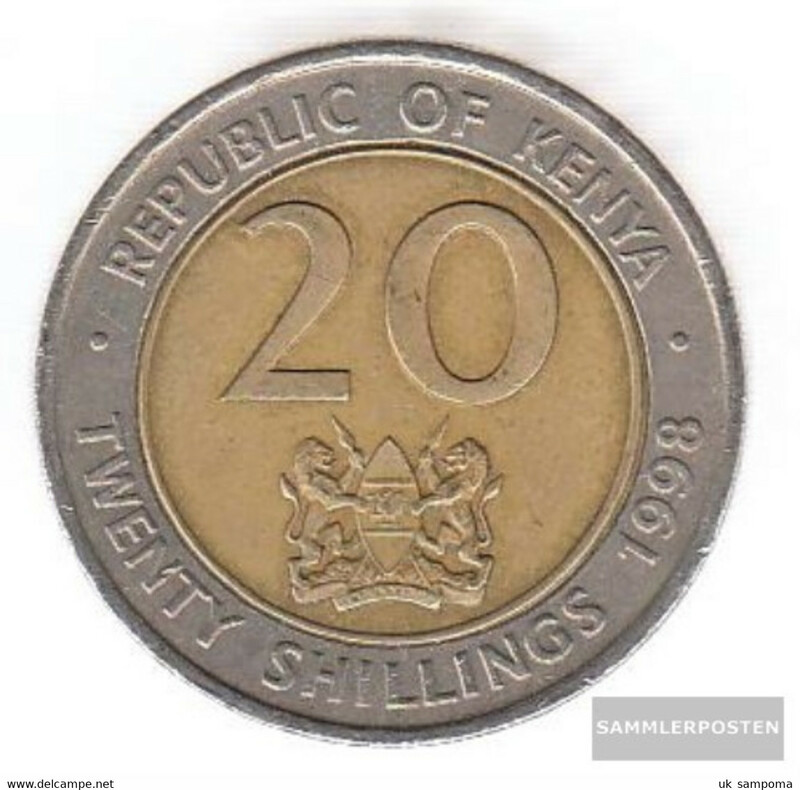 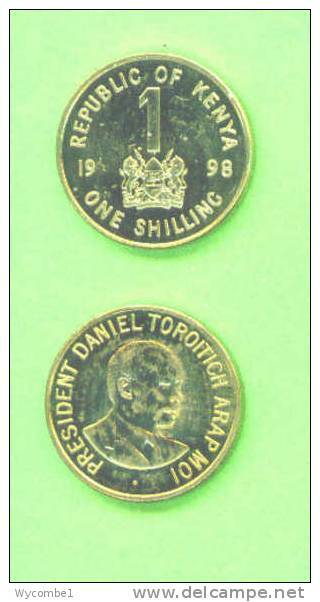 KENYA 1998 TWENTY SHILLINGS ARAP MOI USED COIN. 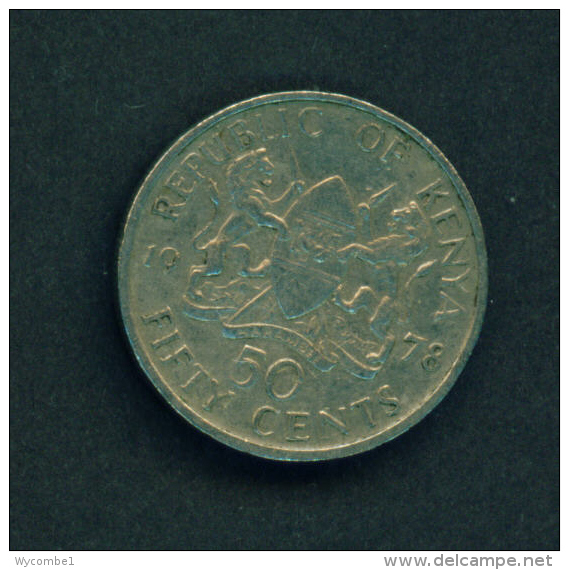 KENYA 1966 FIFTY CENTS KENYATTA Copper-Nickel USED COIN in GOOD CONDITION. 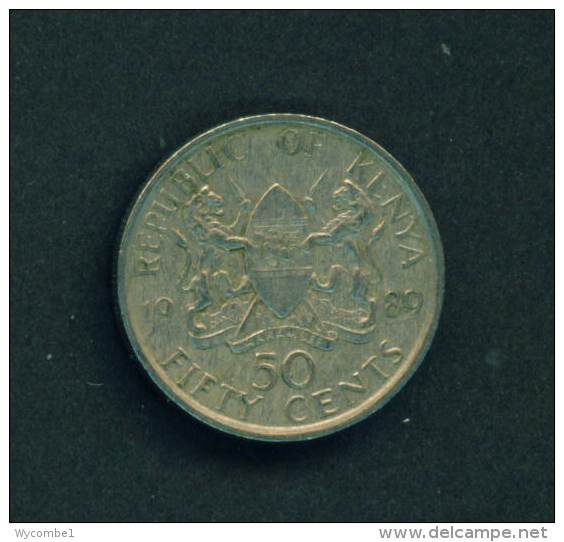 KENYA 1967 FIFTY CENTS KENYATTA Copper-Nickel USED COIN in Very Good CONDITION. 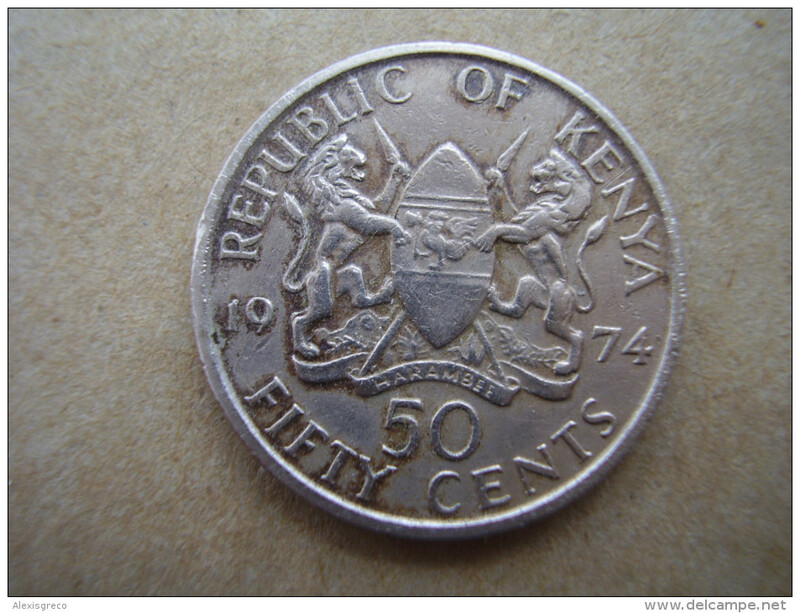 KENYA 1968 FIFTY CENTS KENYATTA Copper-Nickel USED COIN in Good CONDITION. 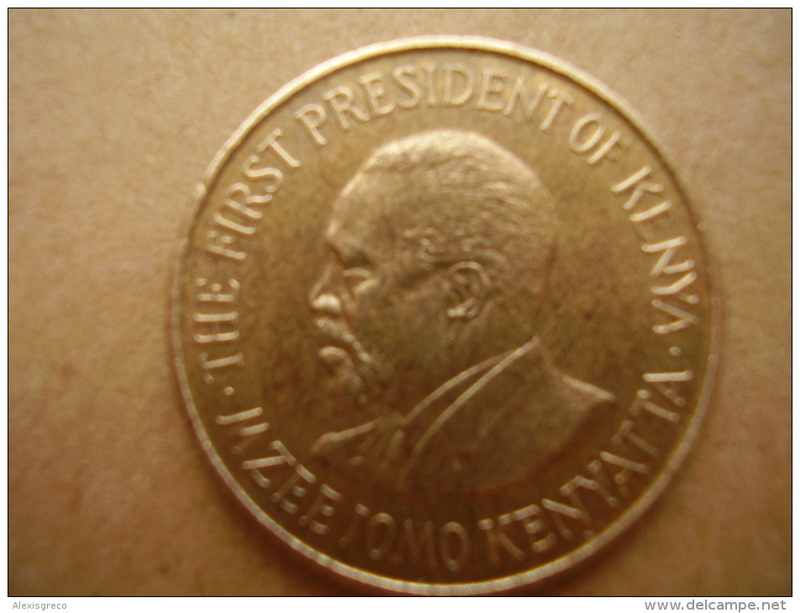 KENYA 1969 FIFTY CENTS KENYATTA Copper-Nickel USED COIN in EXCELLENT CONDITION. 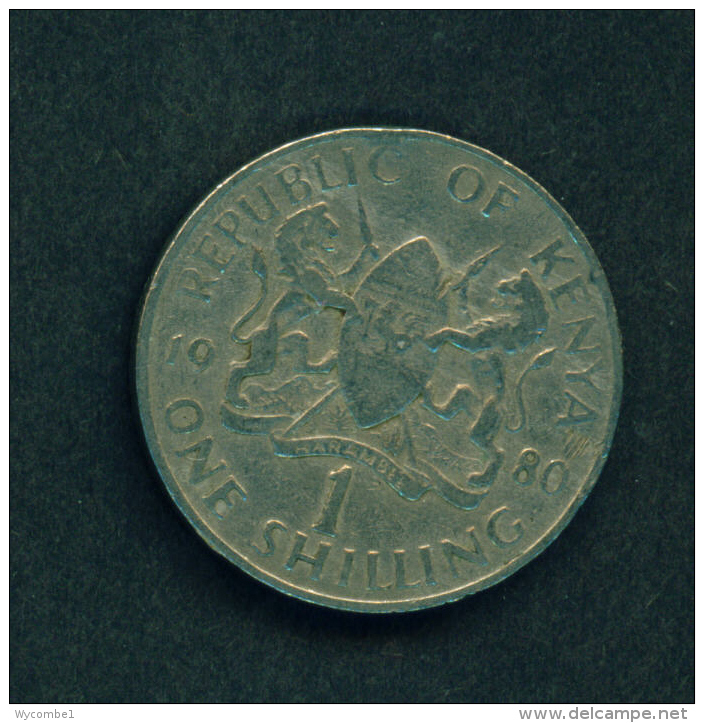 KENYA 1978 ONE SHILLING KENYATTA Copper-Nickel USED COIN in VERY GOOD CONDITION. 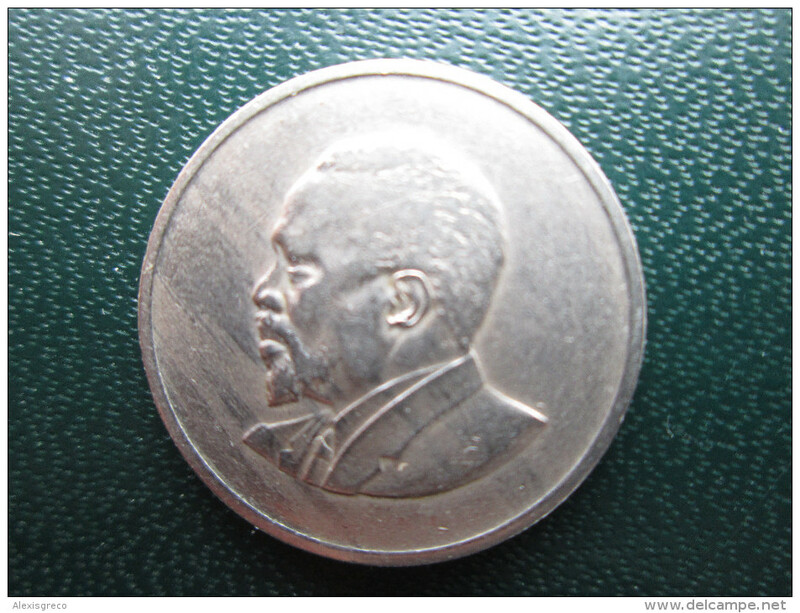 KENYA 1968 FIVE CENTS KENYATTA Nickel-Brass USED COIN in GOOD CONDITION. 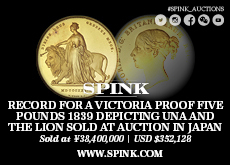 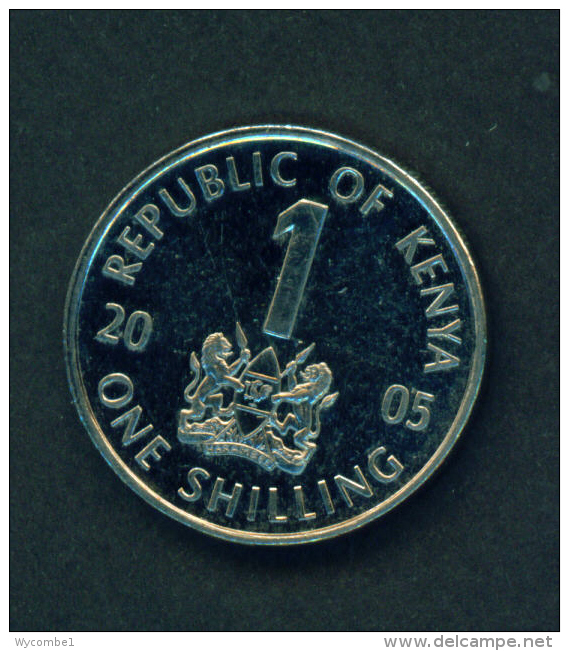 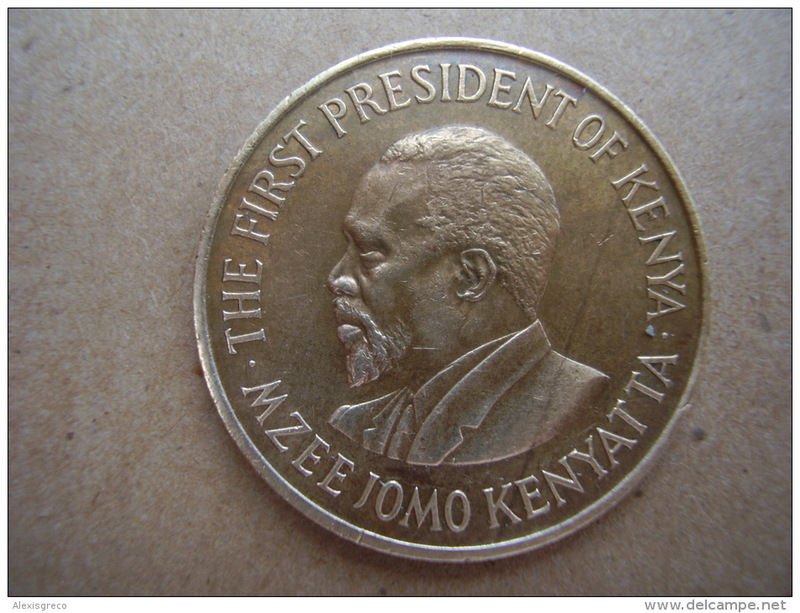 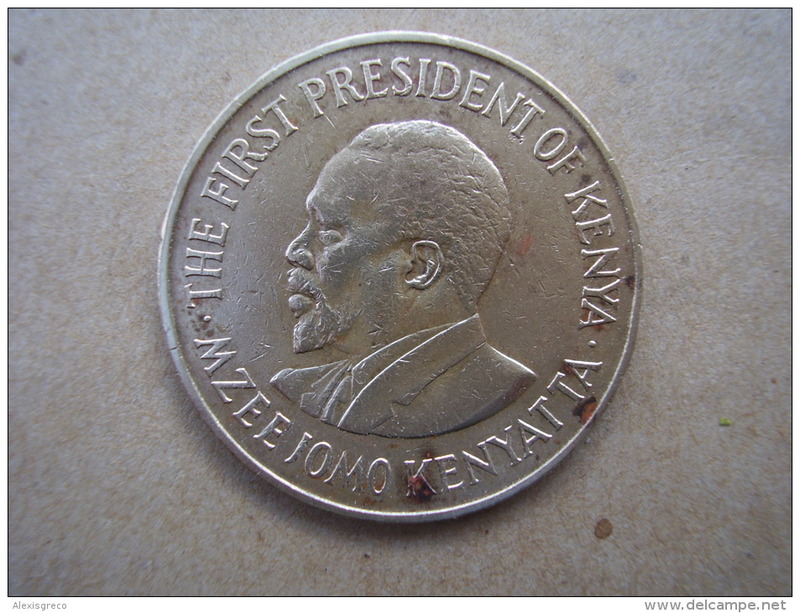 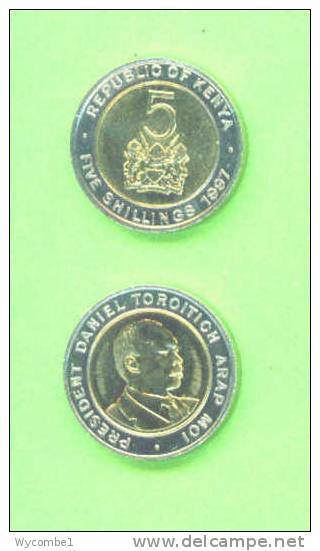 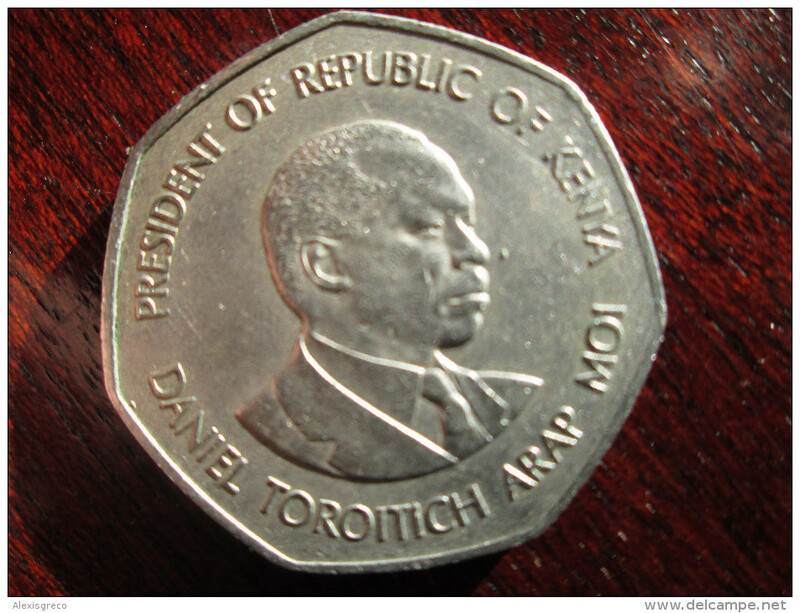 KENYA 1997 ONE SHILLING ARAP MOI USED COIN of Brass Plated Steel. 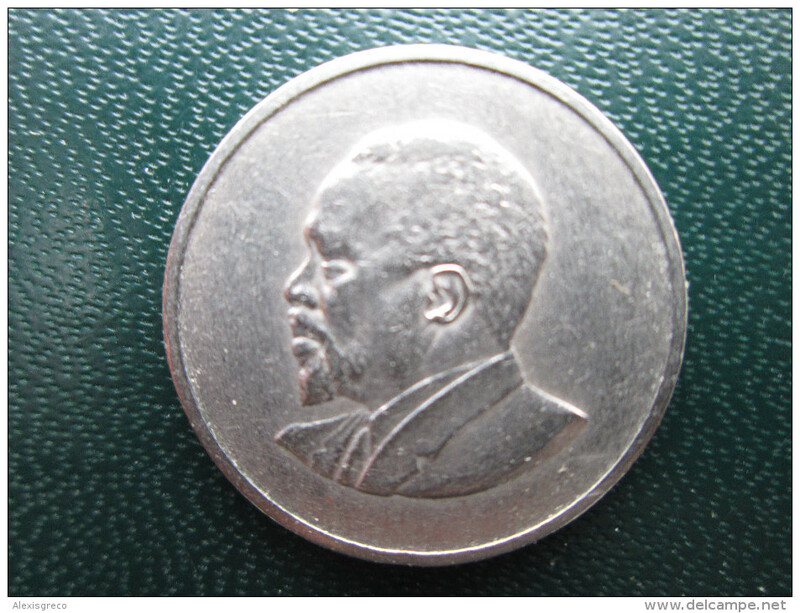 KENYA 1966 TEN CENTS KENYATTA Nickel-Brass USED COIN in GOOD CONDITION. 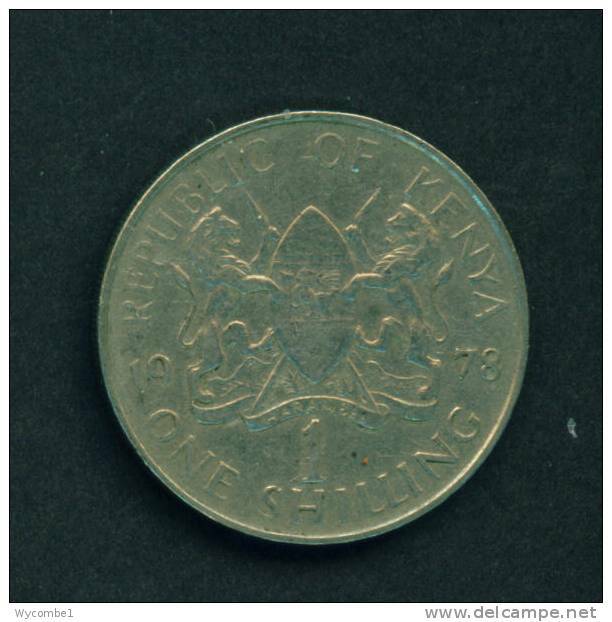 KENYA 1966 ONE SHILLING KENYATTA Copper-Nickel USED COIN in GOOD CONDITION. 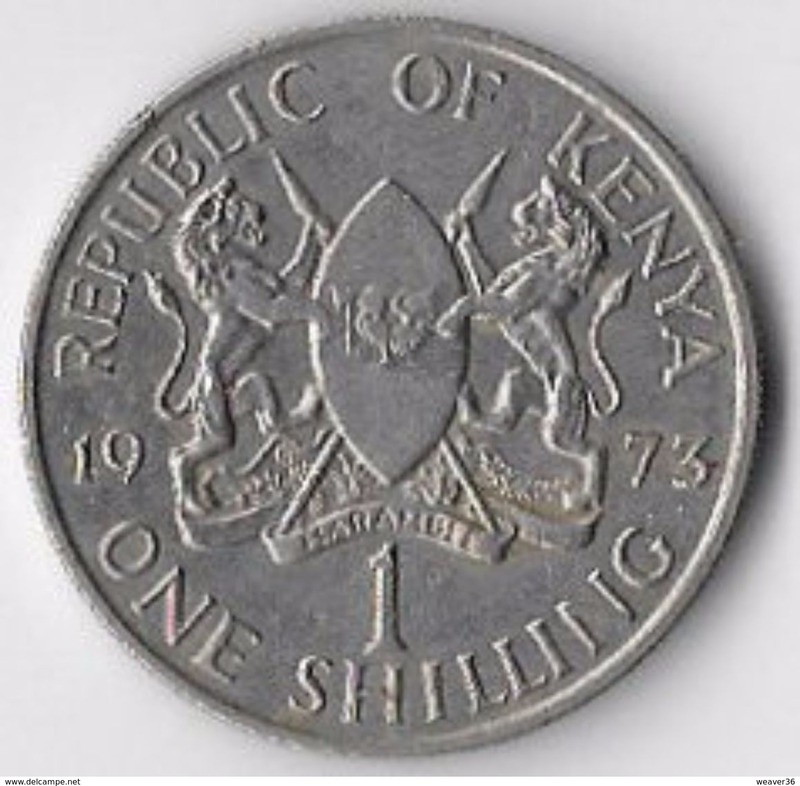 KENYA 1971 ONE SHILLING KENYATTA Copper-Nickel USED COIN in GOOD CONDITION. 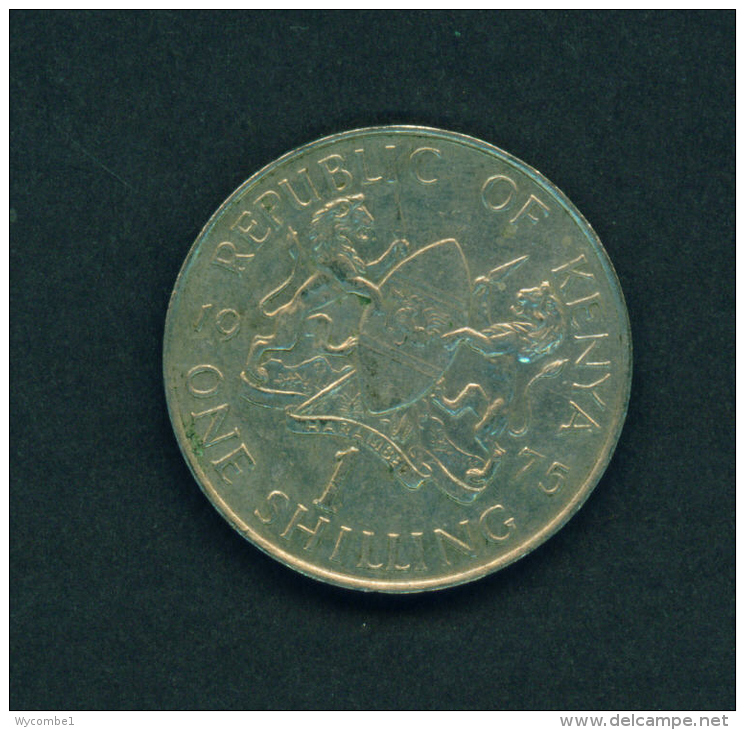 KENYA 1967 ONE SHILLING KENYATTA Copper-Nickel USED COIN in GOOD CONDITION. 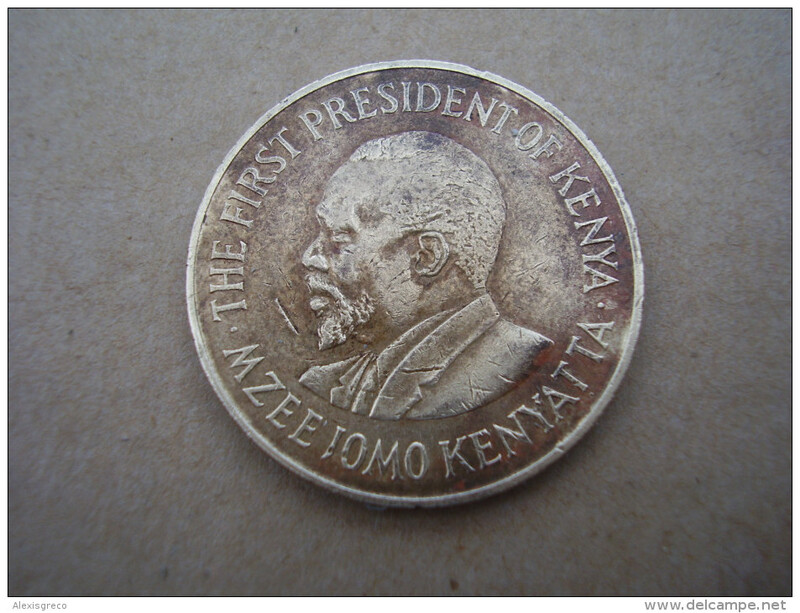 KENYA 1968 ONE SHILLING KENYATTA Copper-Nickel USED COIN in GOOD CONDITION. 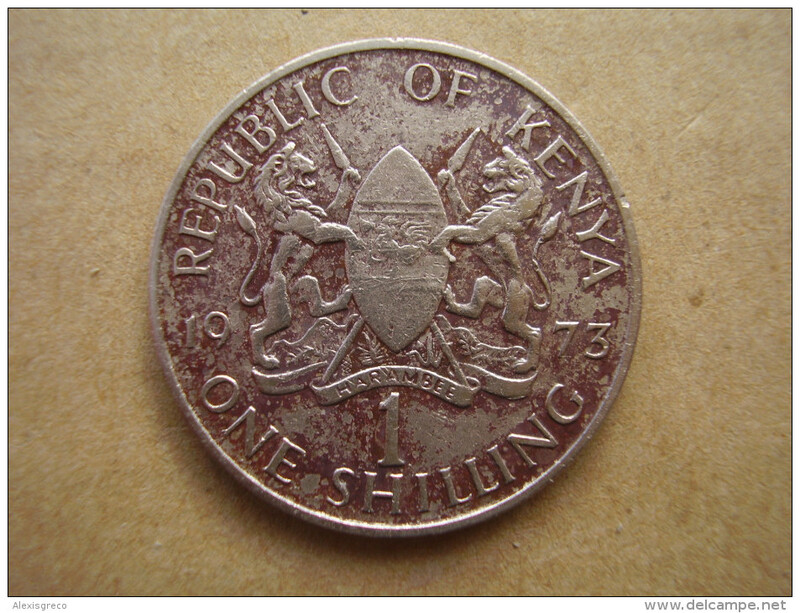 KENYA 1969 ONE SHILLING KENYATTA Copper-Nickel USED COIN in VERY GOOD CONDITION. 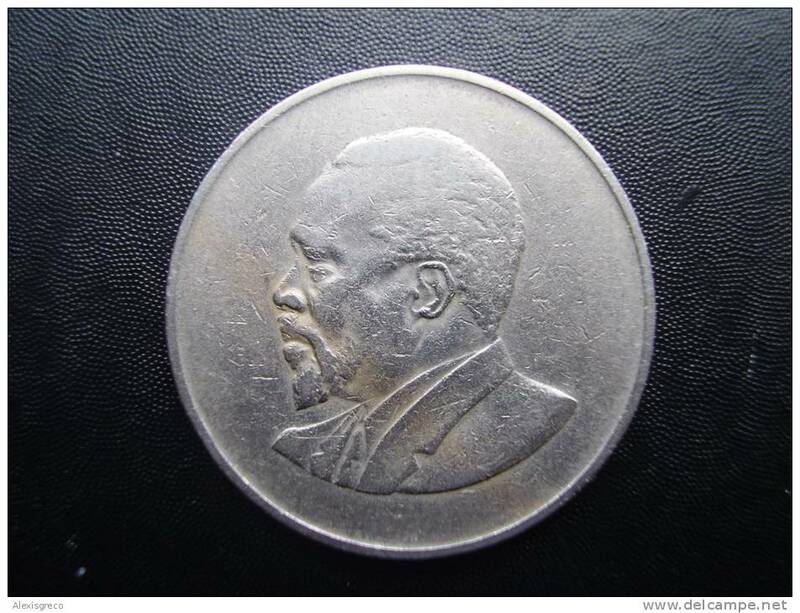 KENYA 1975 FIFTY CENTS KENYATTA Copper-Nickel USED COIN in VERY GOOD CONDITION. 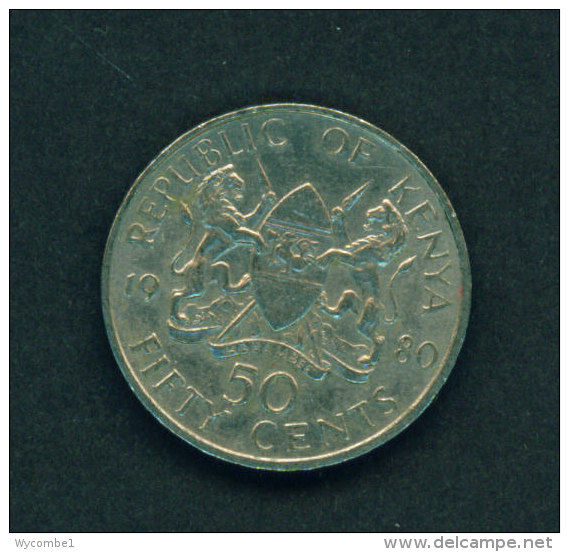 KENYA 1974 FIFTY CENTS KENYATTA Copper-Nickel USED COIN in GOOD CONDITION. 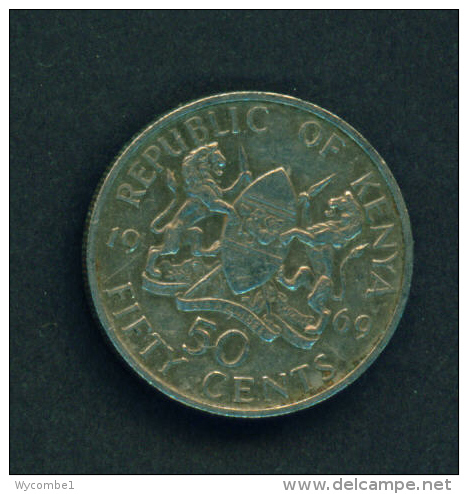 KENYA 1971 FIFTY CENTS KENYATTA Copper-Nickel USED COIN in VERY GOOD CONDITION. 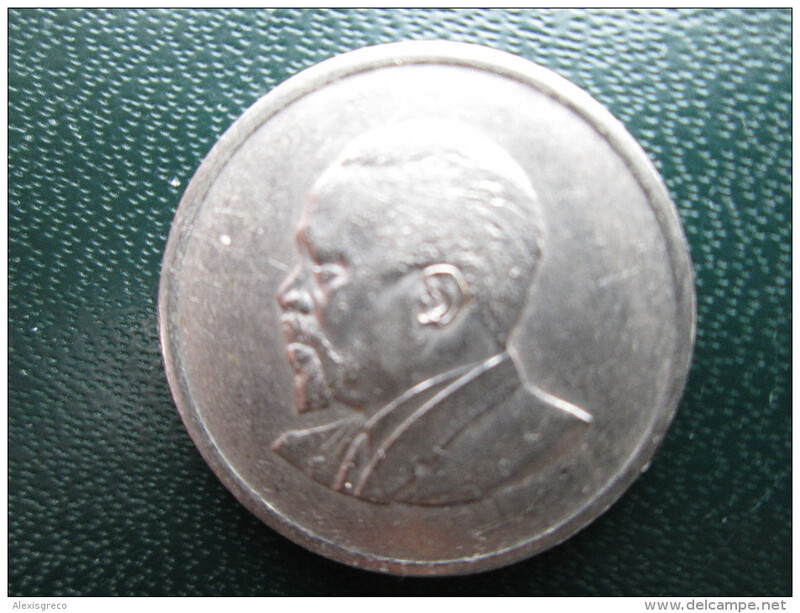 KENYA 1969 FIFTY CENTS KENYATTA Copper-Nickel USED COIN in GOOD CONDITION. 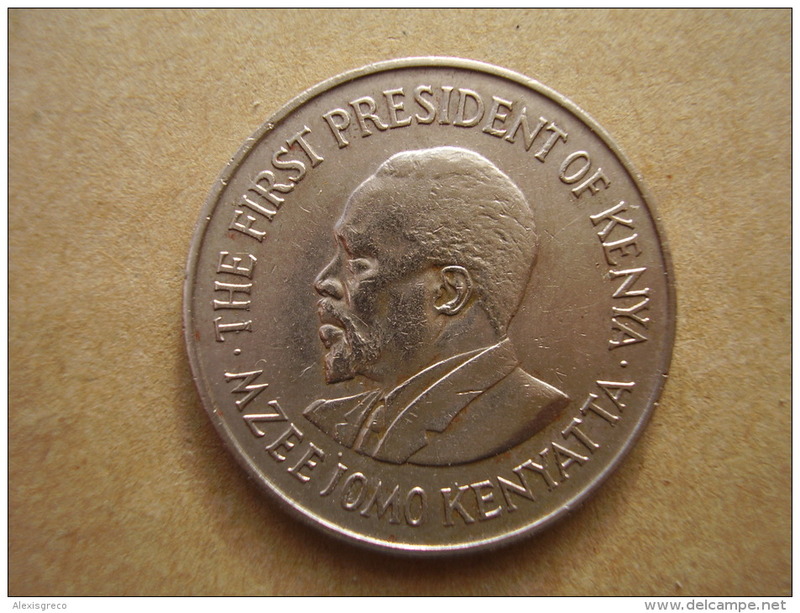 KENYA 1967 FIFTY CENTS KENYATTA Copper-Nickel USED COIN in GOOD CONDITION. 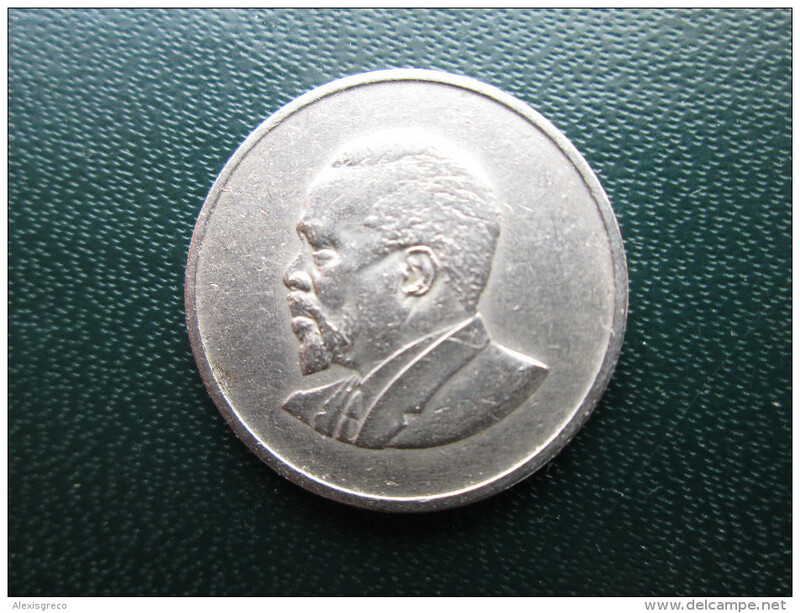 KENYA 1966 FIVE CENTS KENYATTA Nickel-Brass USED COIN in GOOD CONDITION. 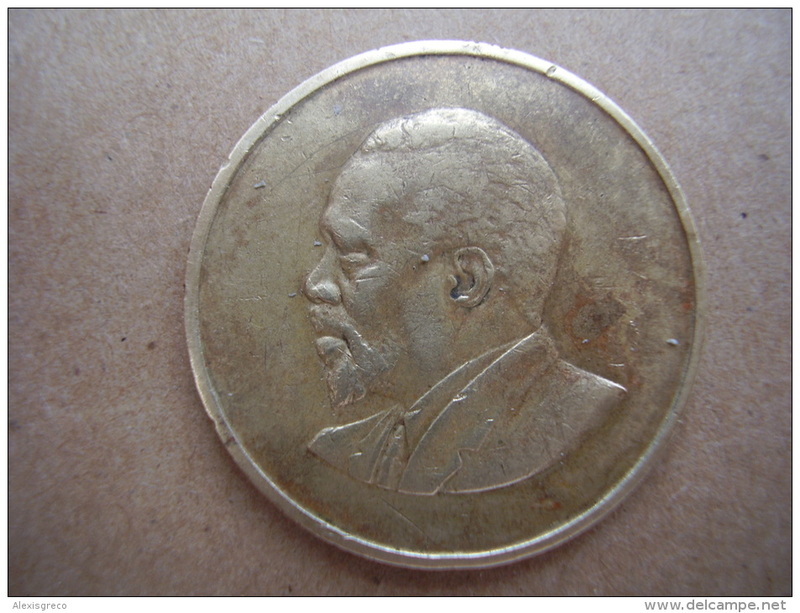 KENYA 1967 FIVE CENTS KENYATTA Nickel-Brass USED COIN in FAIR CONDITION. 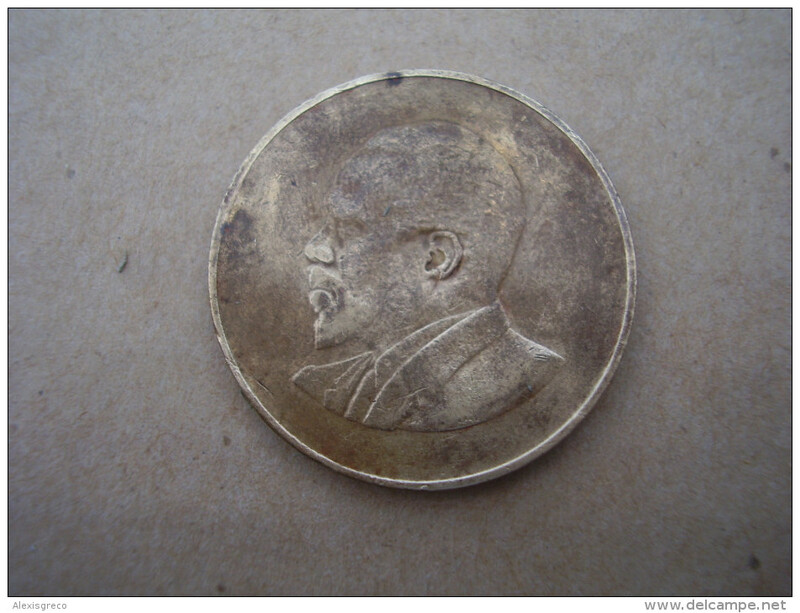 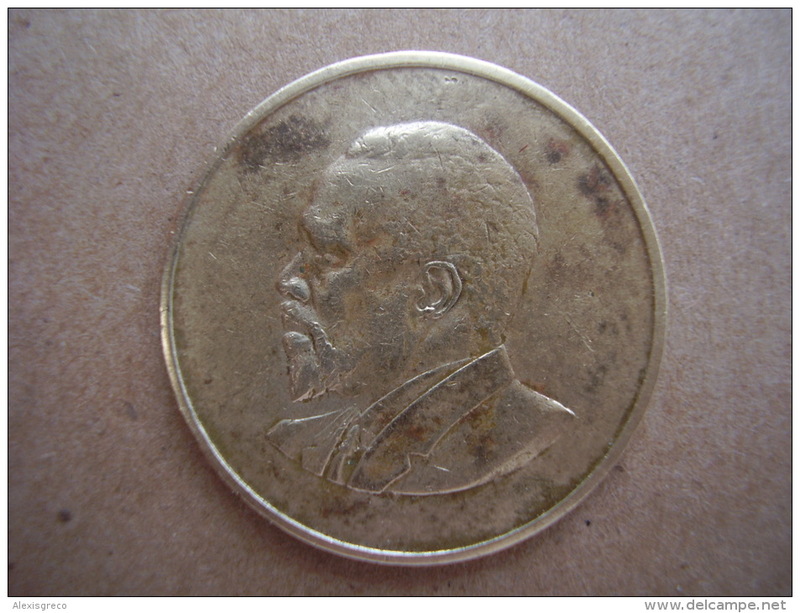 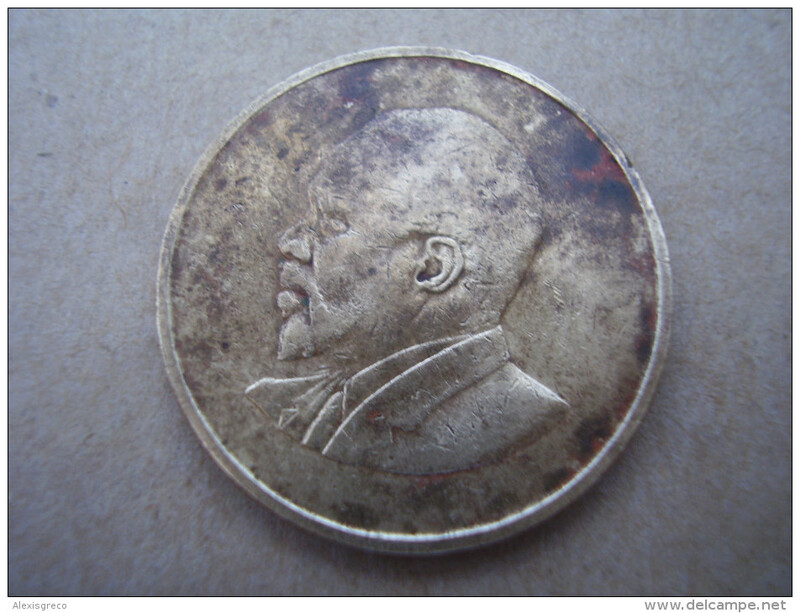 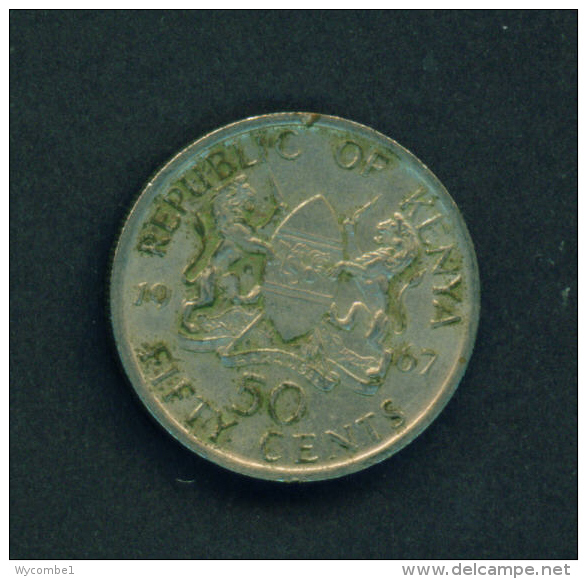 KENYA 1968 FIVE CENTS KENYATTA Nickel-Brass USED COIN in FAIR CONDITION. 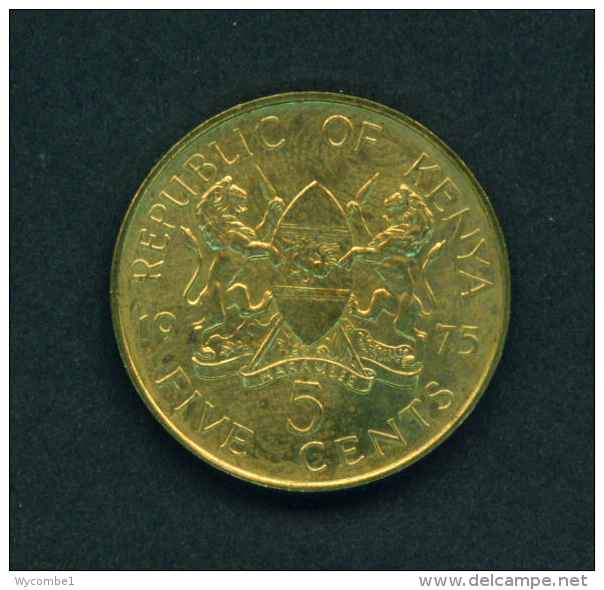 KENYA 1970 FIVE CENTS KENYATTA Nickel-Brass USED COIN in GOOD CONDITION. 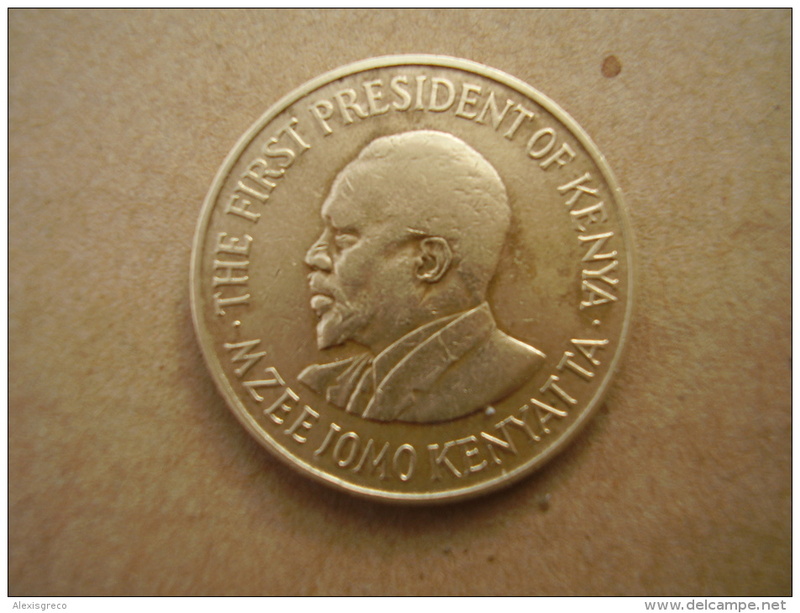 KENYA 1971 FIVE CENTS KENYATTA Nickel-Brass USED COIN in FAIR CONDITION. 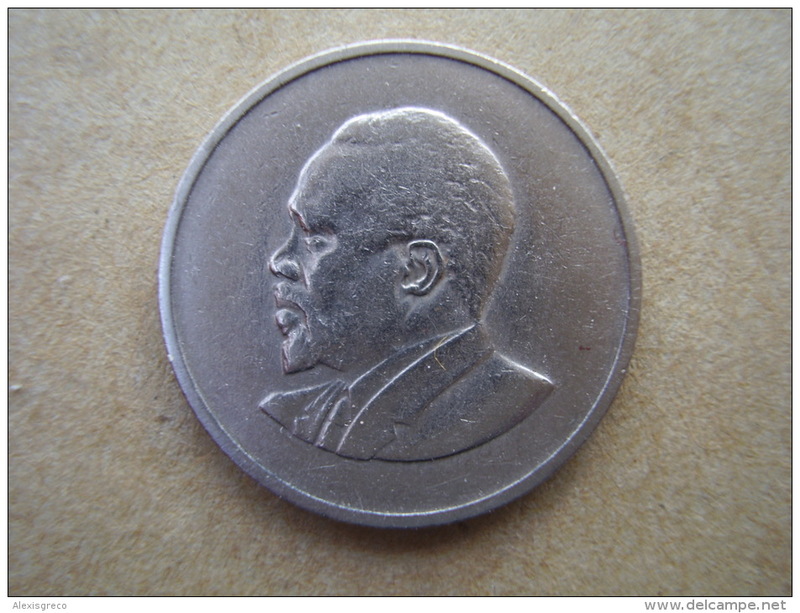 KENYA 1967 TEN CENTS KENYATTA Nickel-Brass USED COIN in GOOD CONDITION. 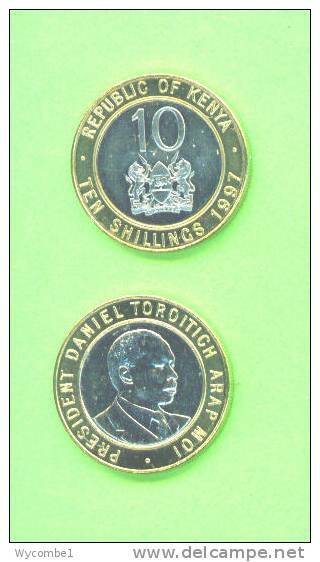 KENYA 1969 TEN CENTS KENYATTA Nickel-Brass USED COIN in GOOD CONDITION. 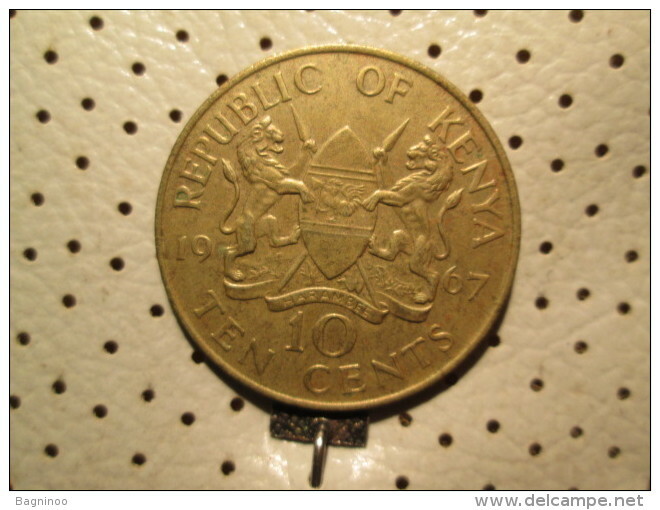 KENYA 1970 TEN CENTS KENYATTA Nickel-Brass USED COIN in FAIR CONDITION. 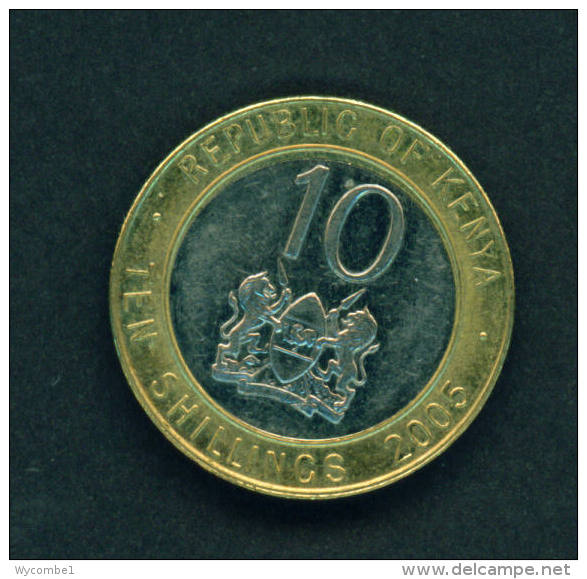 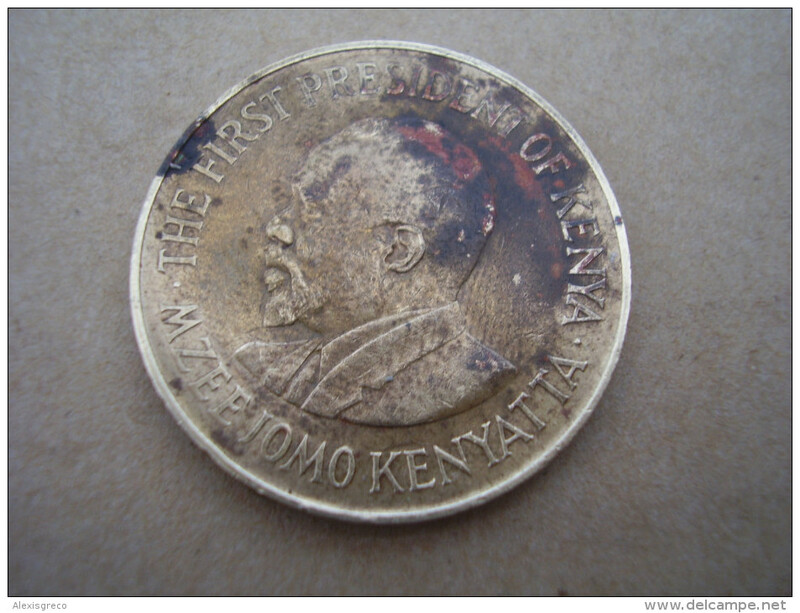 KENYA 1971 TEN CENTS KENYATTA Nickel-Brass USED COIN in FAIR CONDITION. 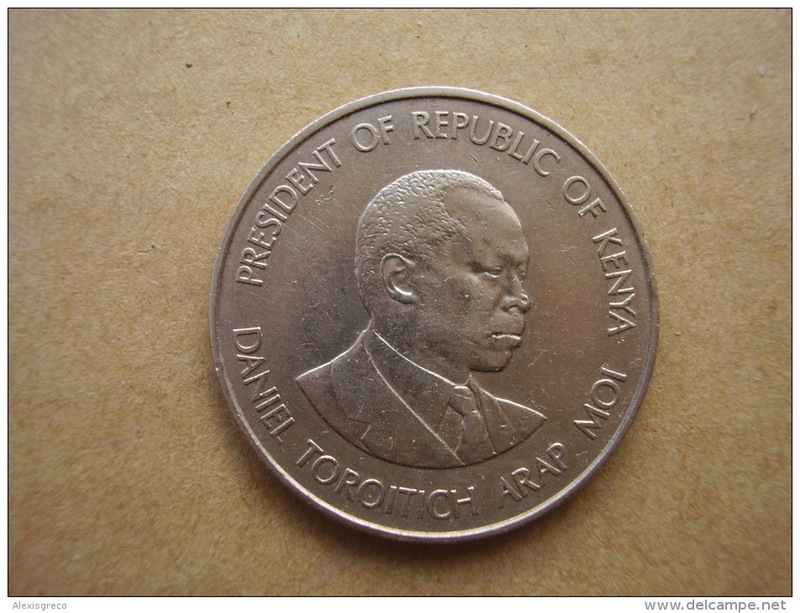 KENYA 1980 ONE SHILLING ARAP MOI Copper-Nickel USED COIN in VERY GOOD CONDITION. 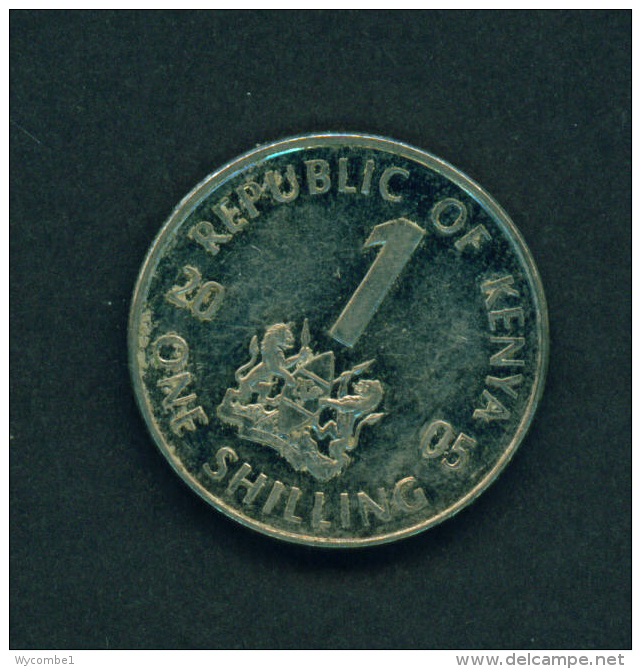 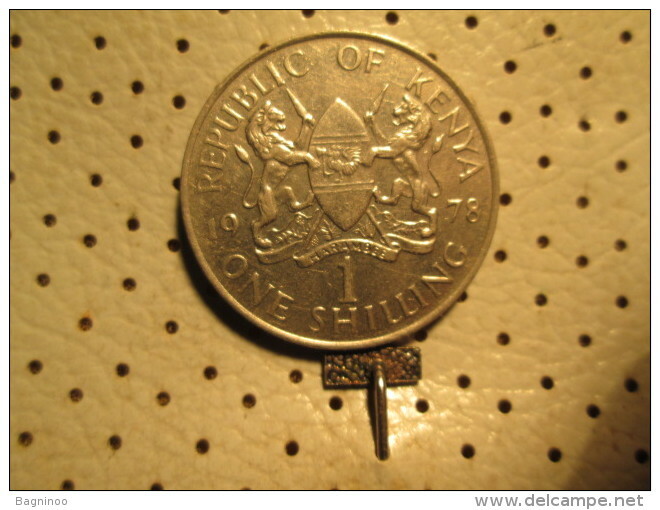 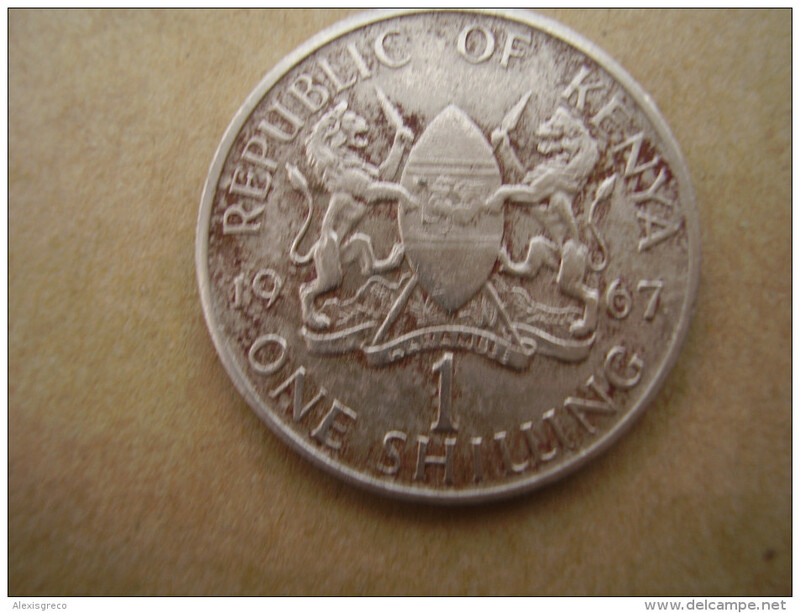 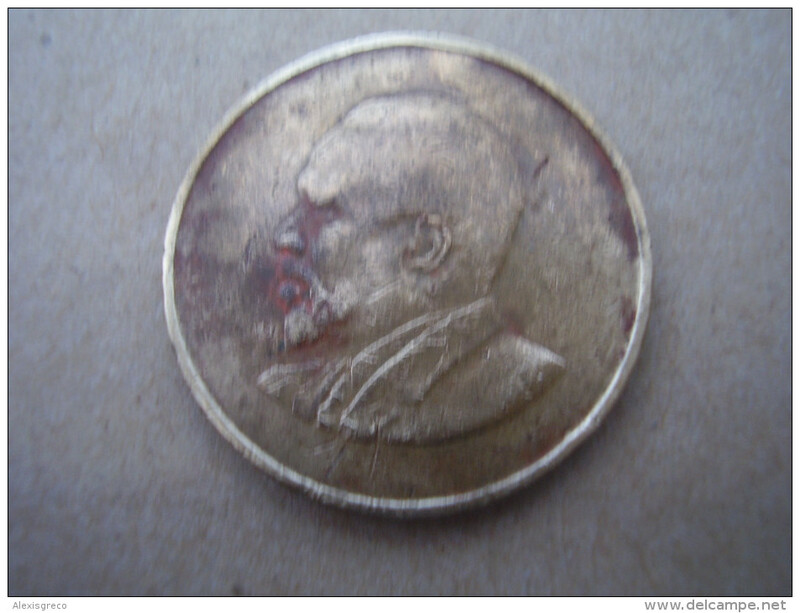 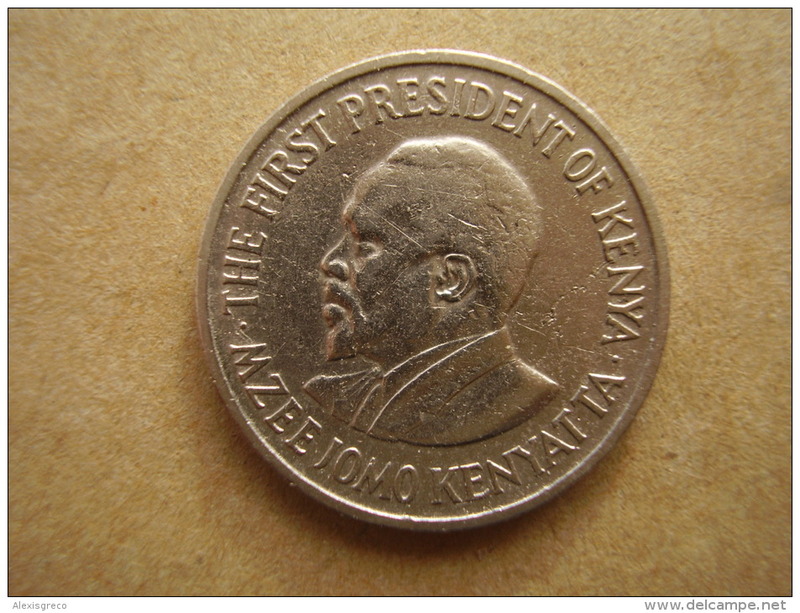 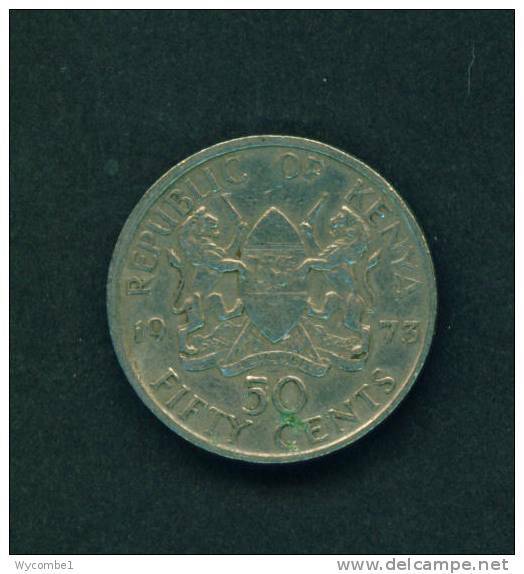 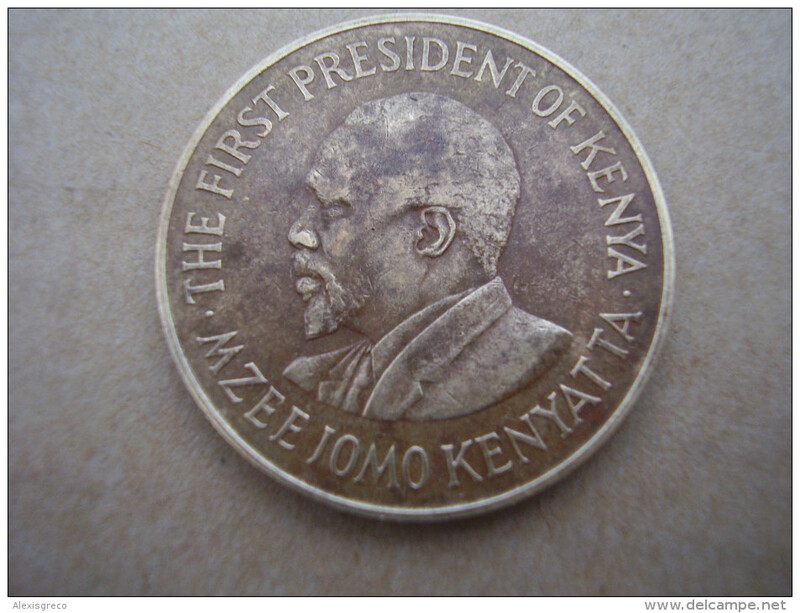 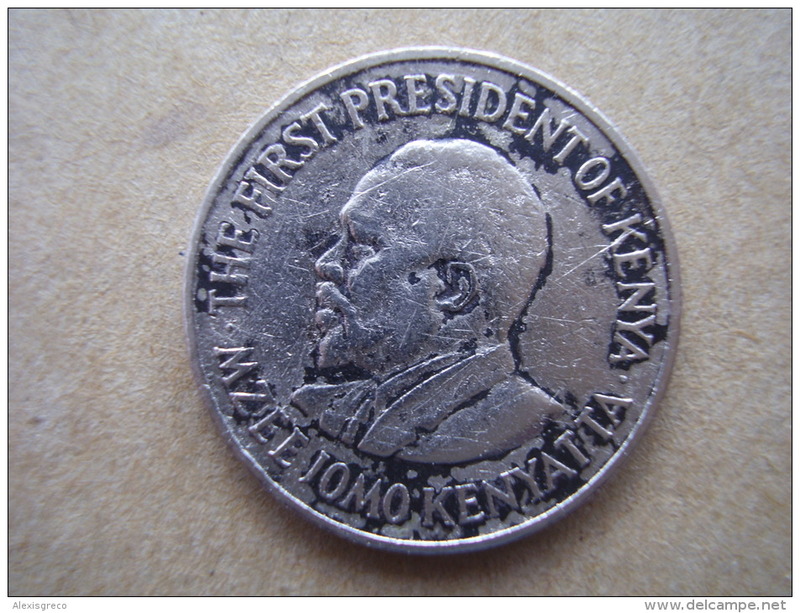 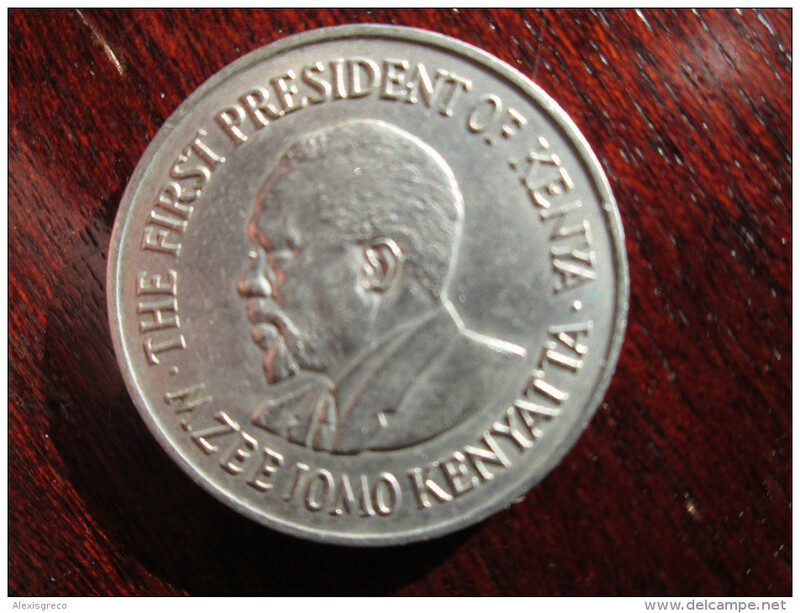 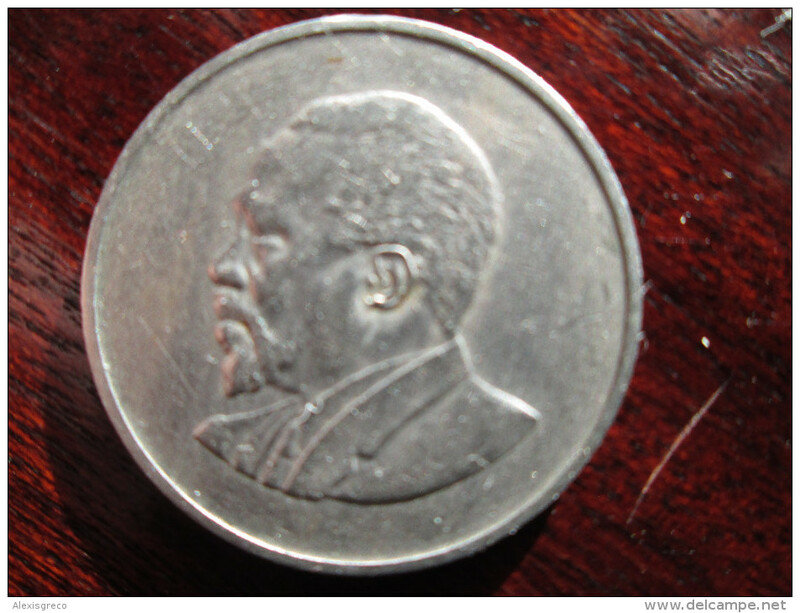 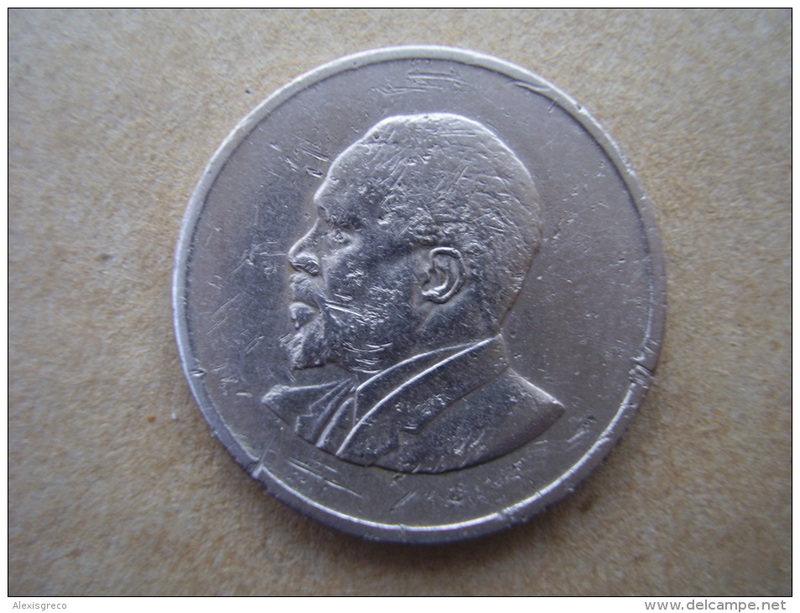 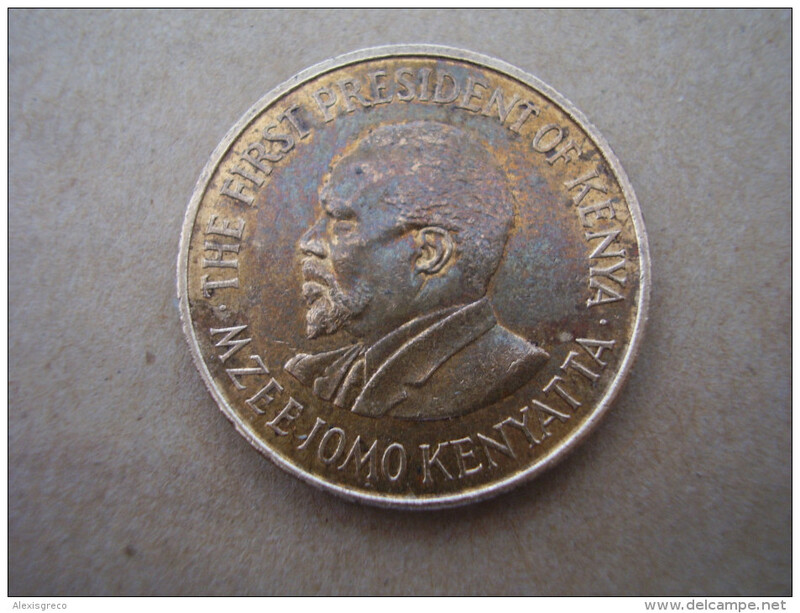 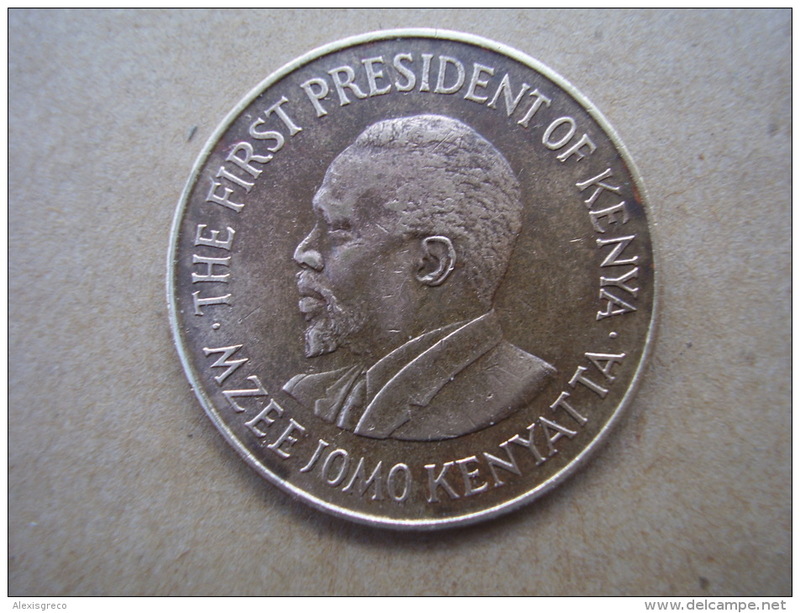 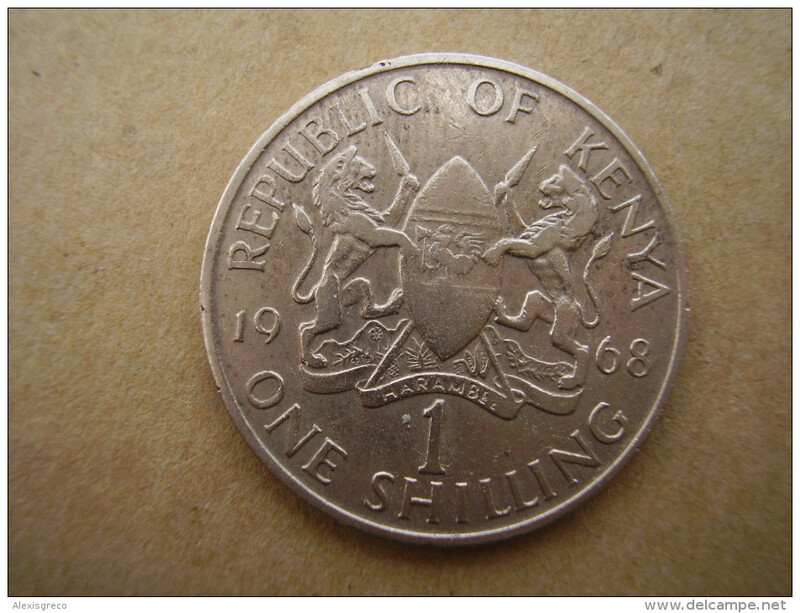 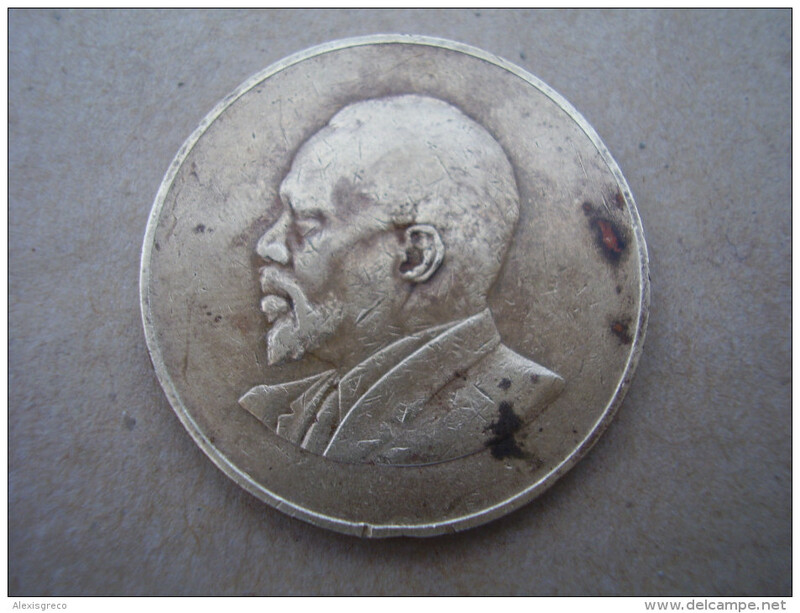 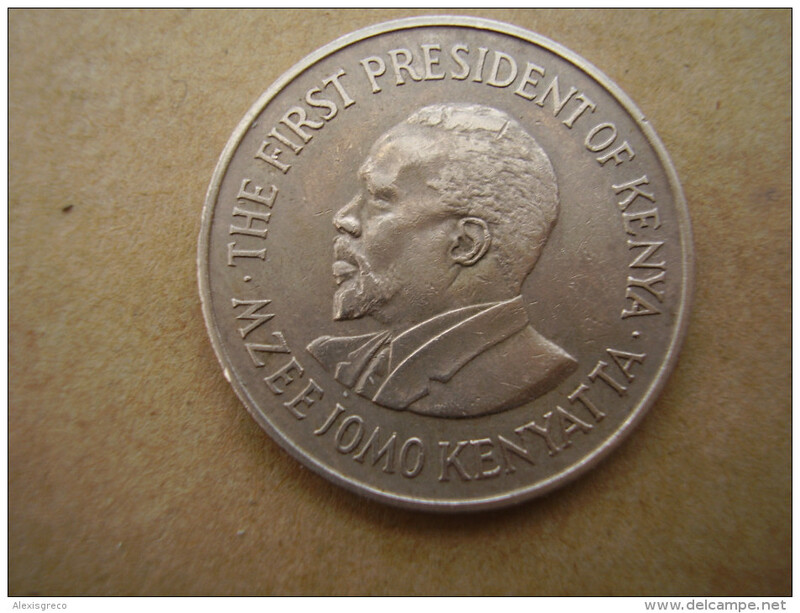 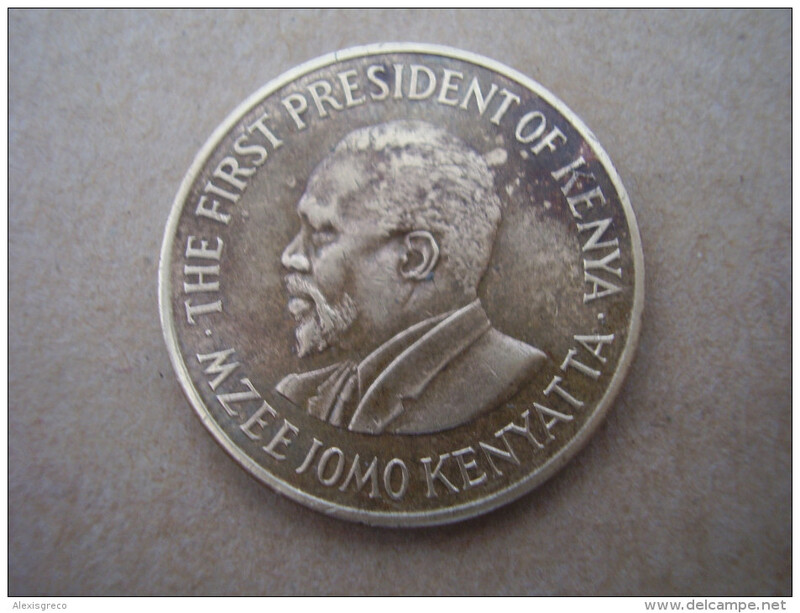 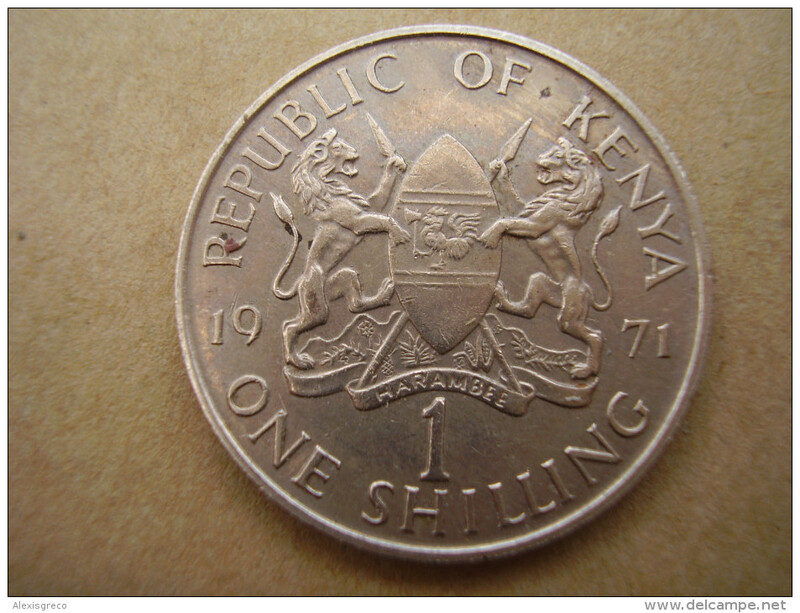 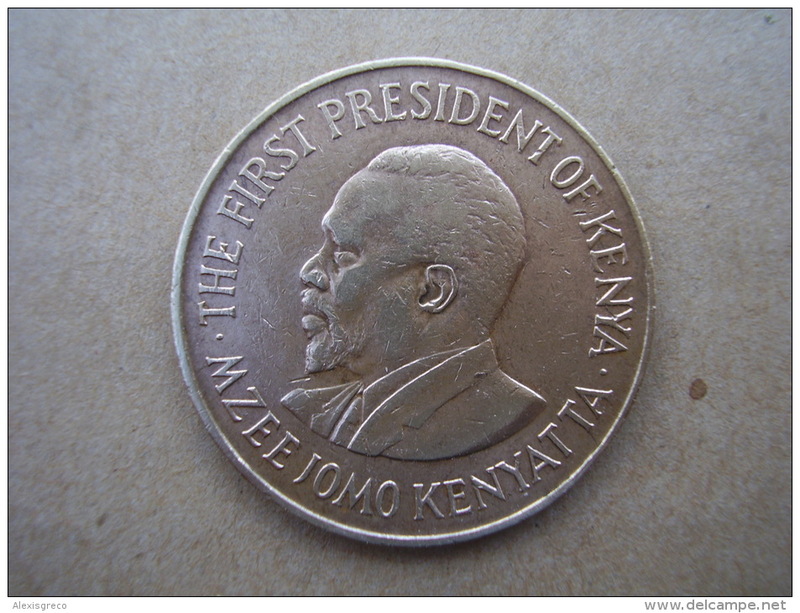 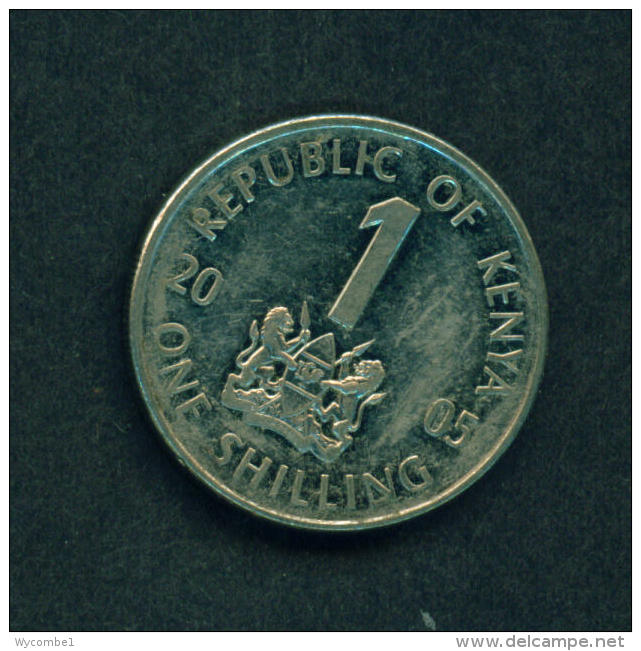 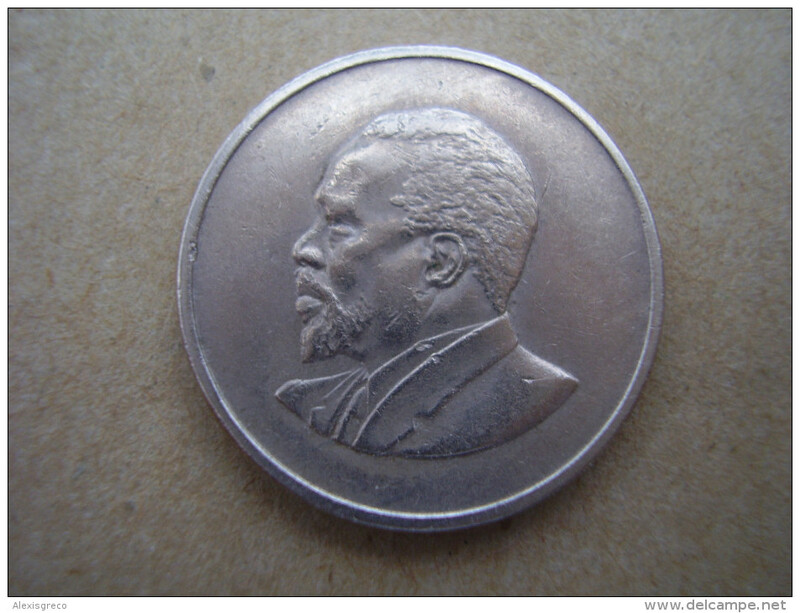 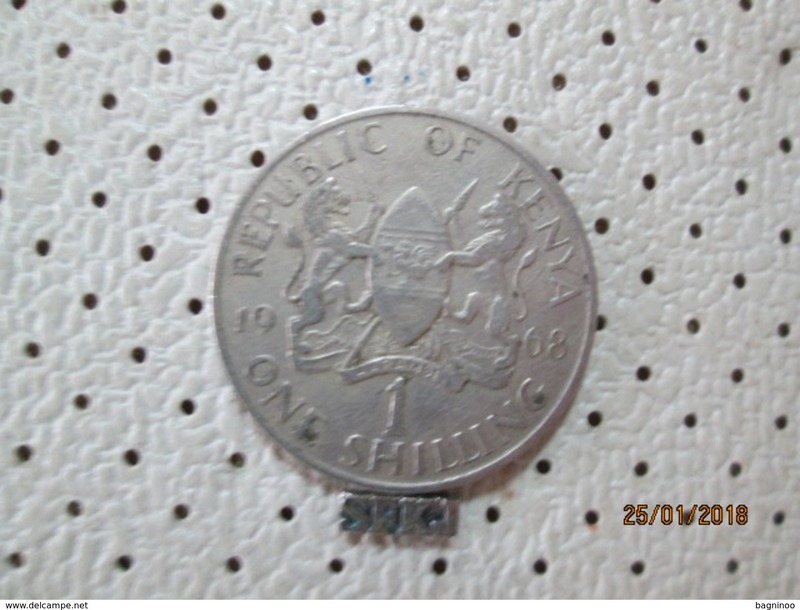 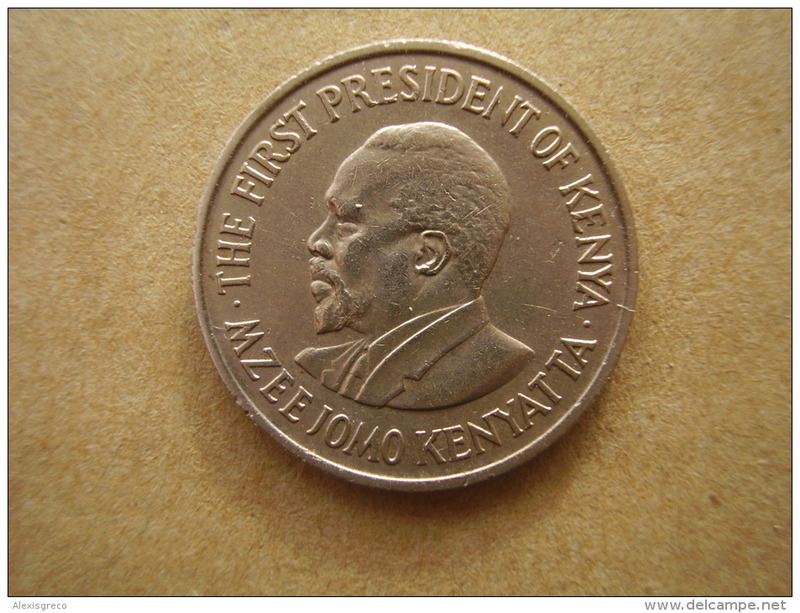 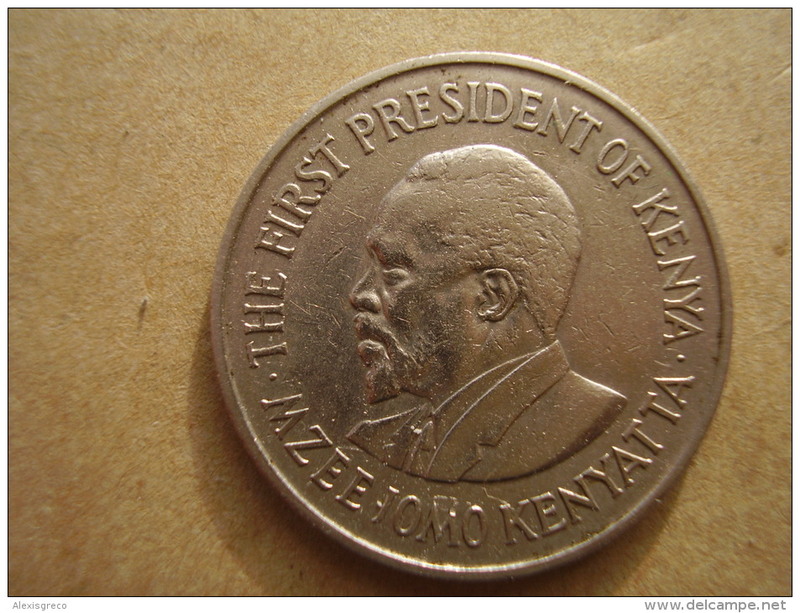 KENYA 1973 ONE SHILLING KENYATTA Copper-Nickel USED COIN in FAIR CONDITION. 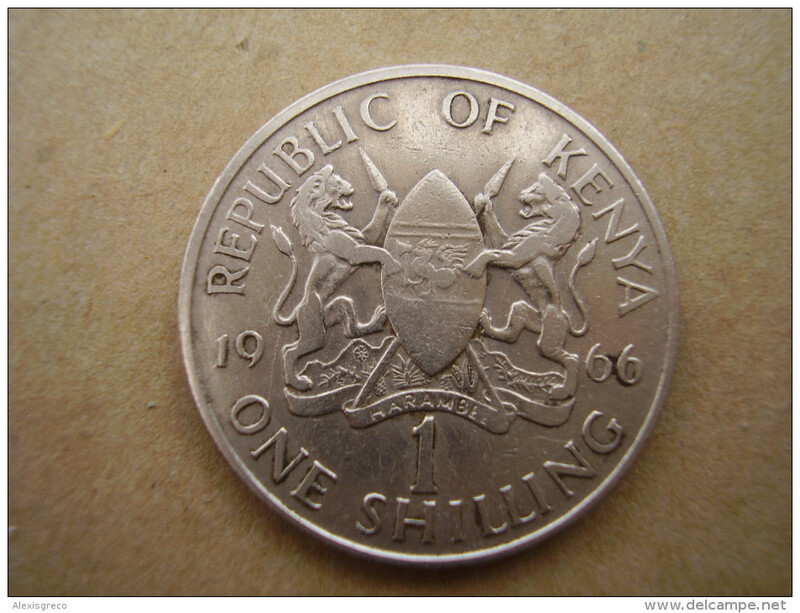 KENYA 1969 ONE SHILLING KENYATTA Copper-Nickel USED COIN in GOOD CONDITION. 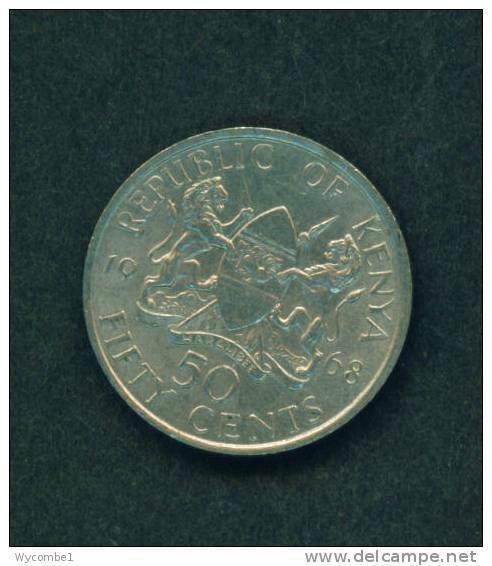 KENYA 1975 FIFTY CENTS KENYATTA Copper-Nickel USED COIN in GOOD CONDITION. 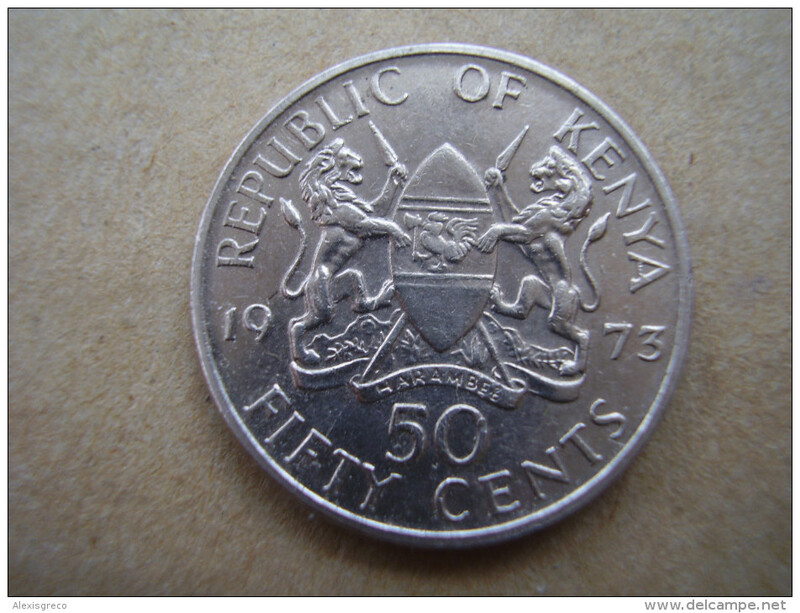 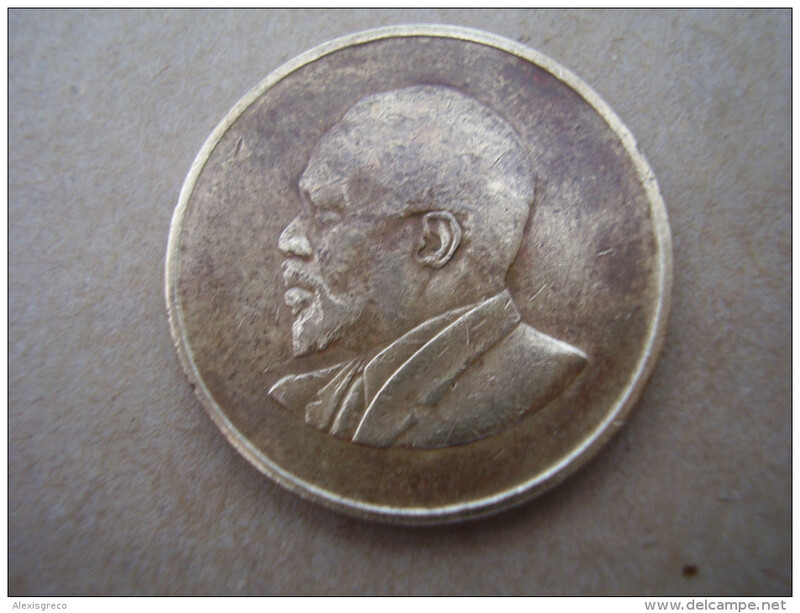 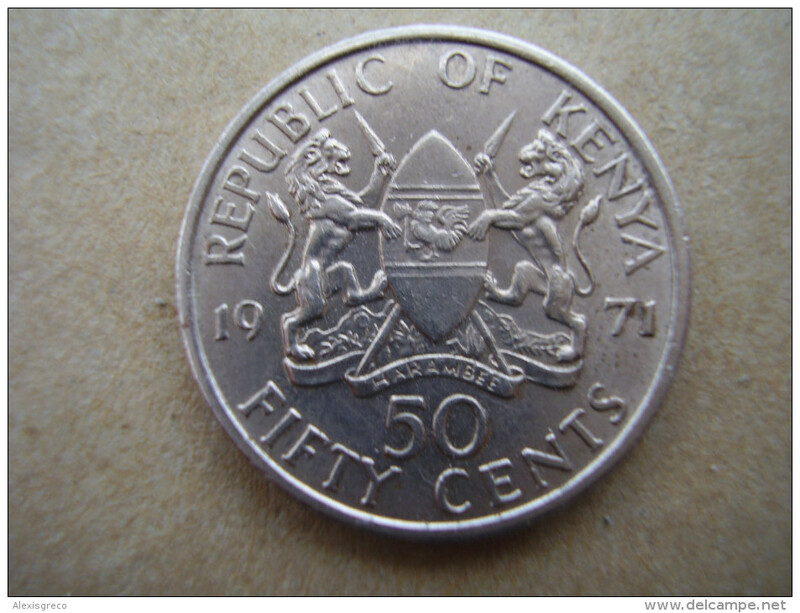 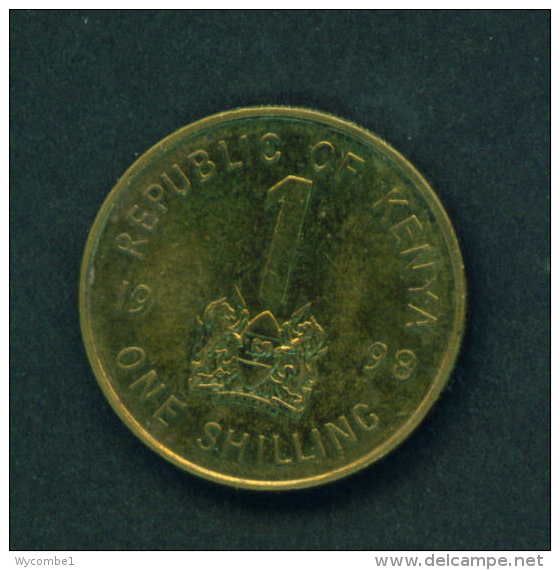 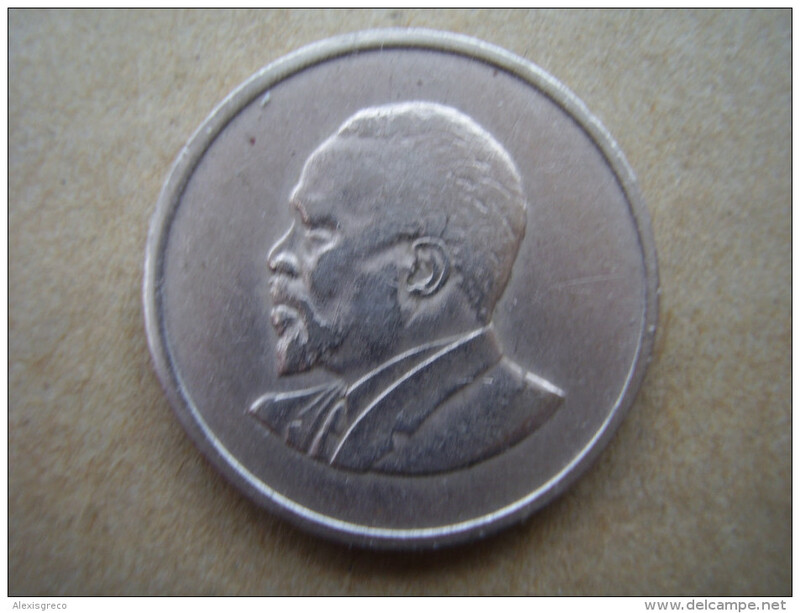 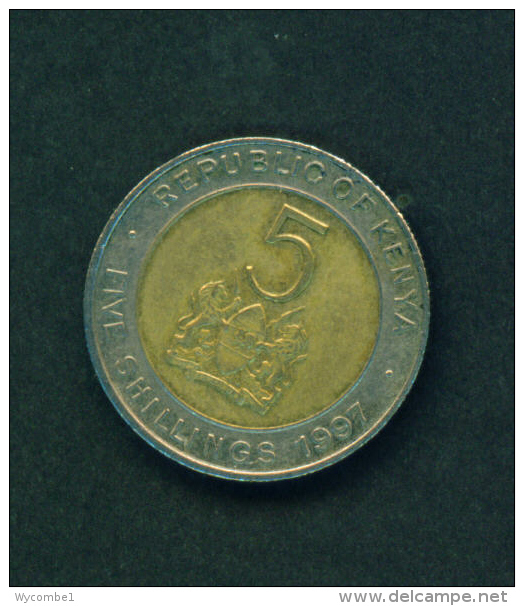 KENYA 1969 FIFTY CENTS KENYATTA Copper-Nickel USED COIN in AVERAGE CONDITION. KENYA 1978 TEN CENTS KENYATTA Nickel-Brass USED COIN in GOOD CONDITION. 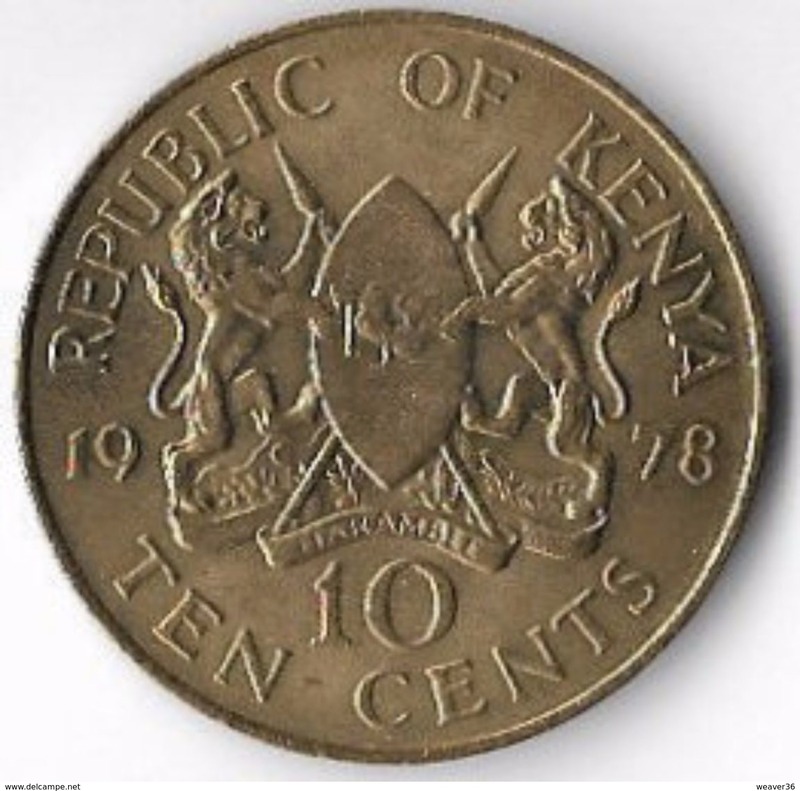 KENYA 1971 TEN CENTS KENYATTA Nickel-Brass USED COIN in VERY GOOD CONDITION. KENYA 1970 TEN CENTS KENYATTA Nickel-Brass USED COIN in GOOD CONDITION. 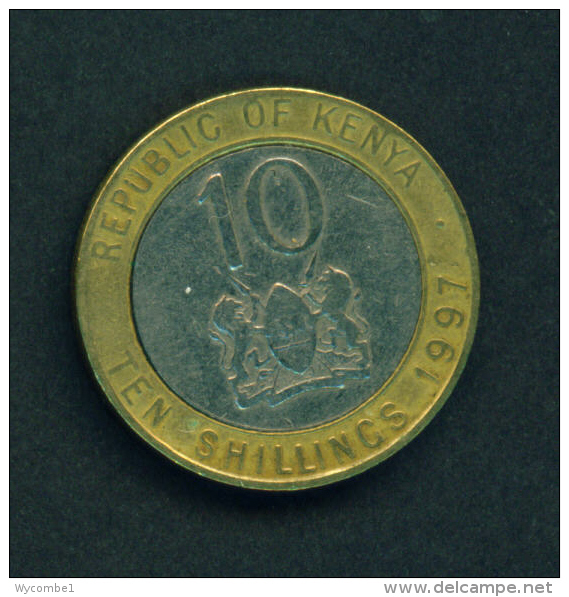 KENYA - 1977 10c Circ. 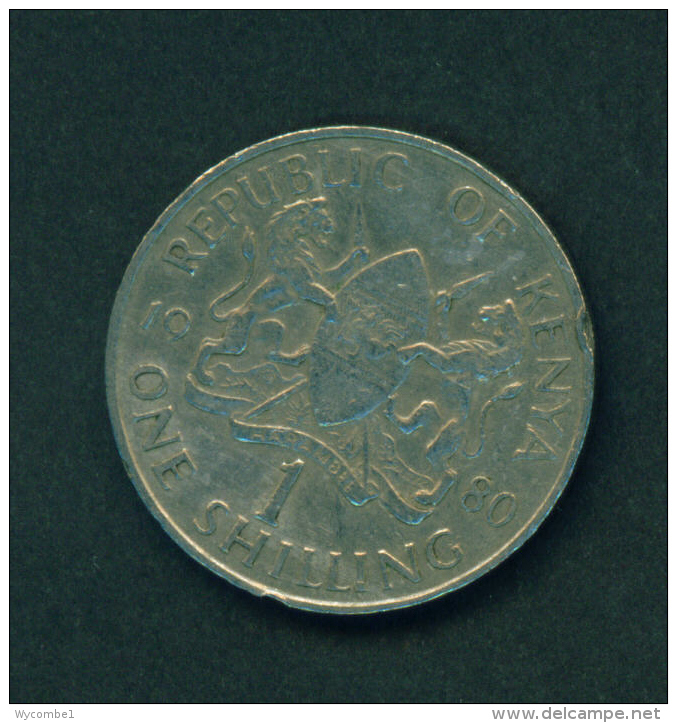 KENYA - 1975 5c Circ. 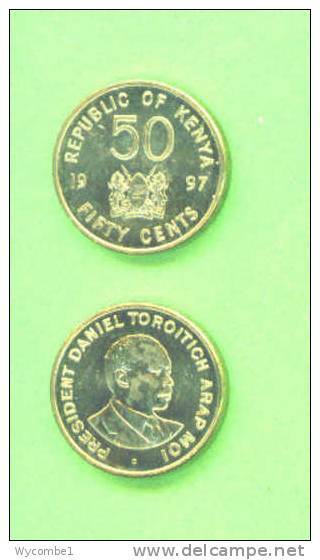 KENYA - 1989 50c Circ. 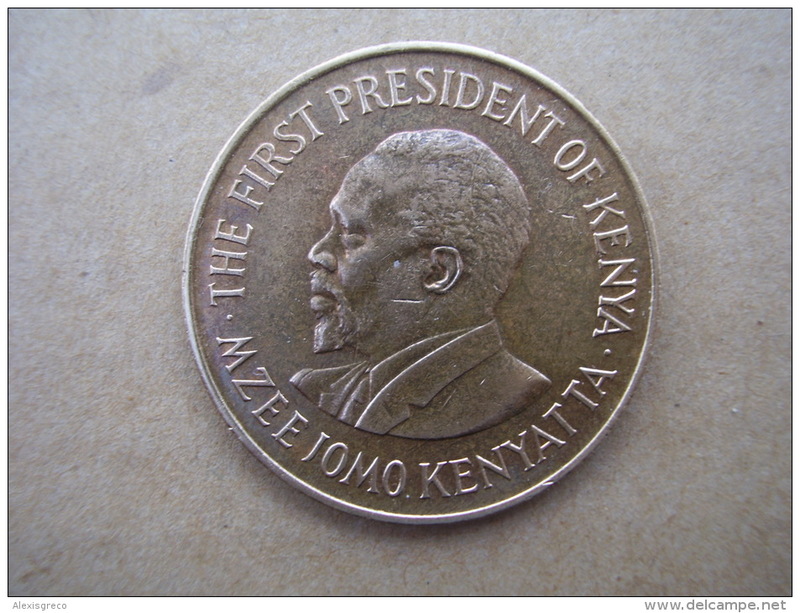 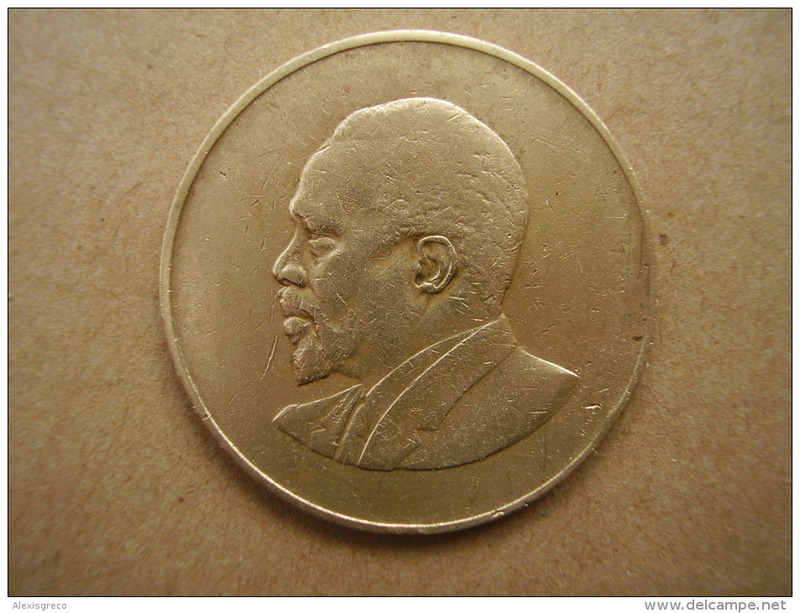 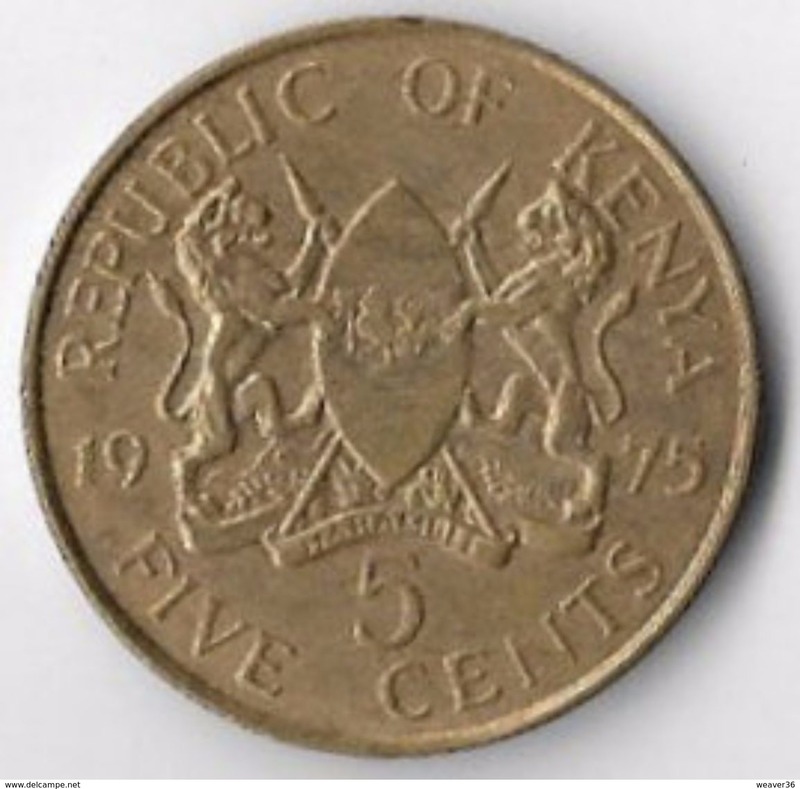 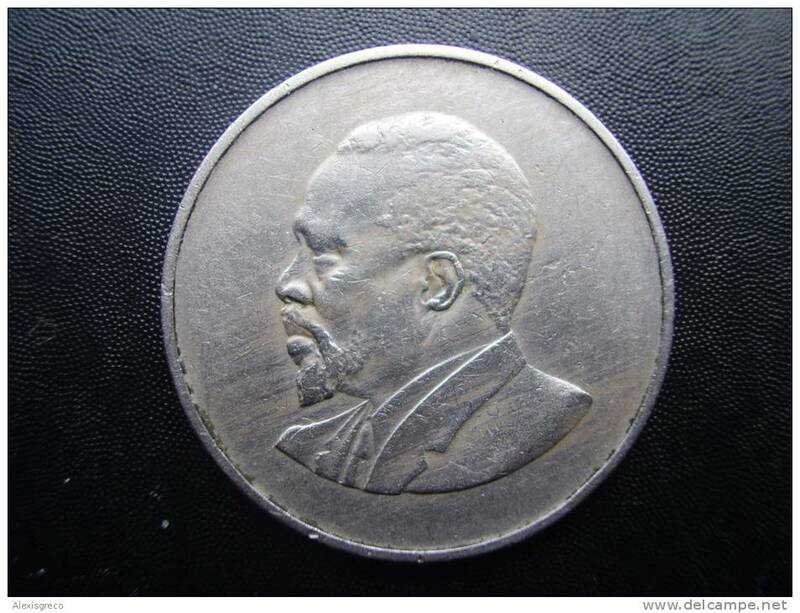 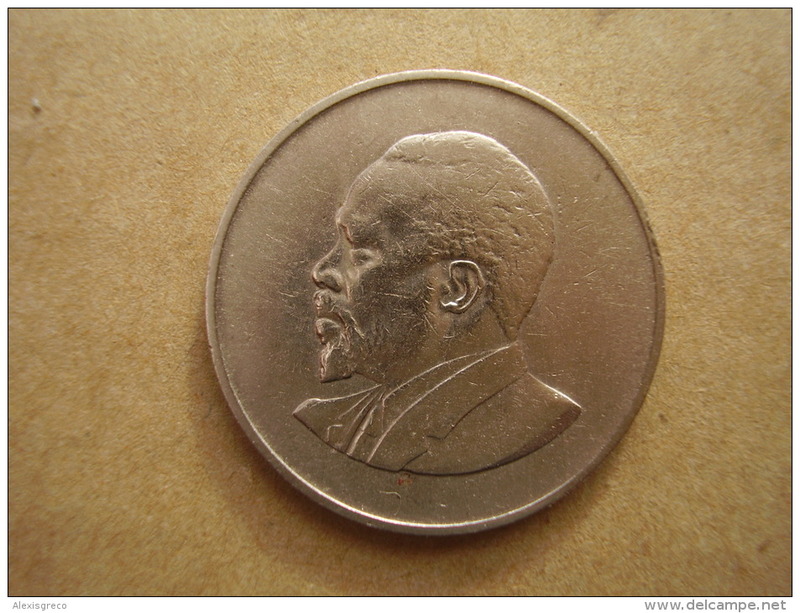 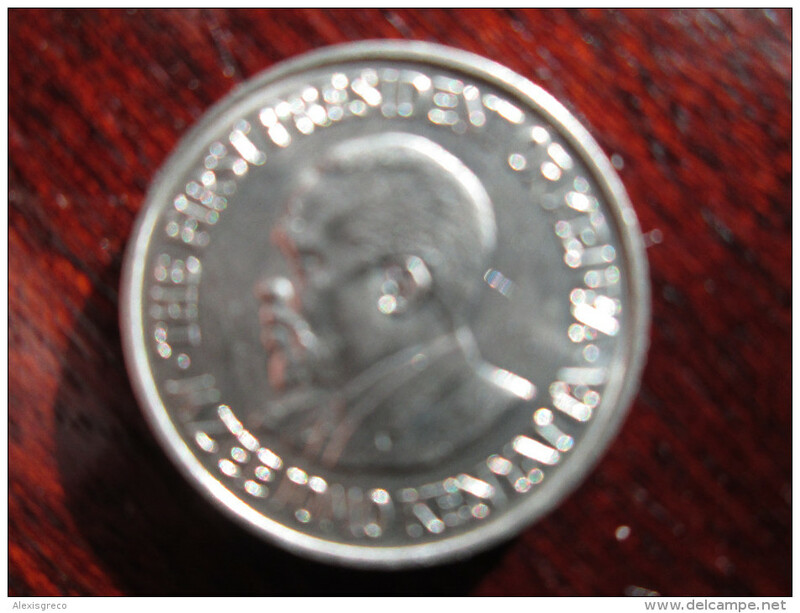 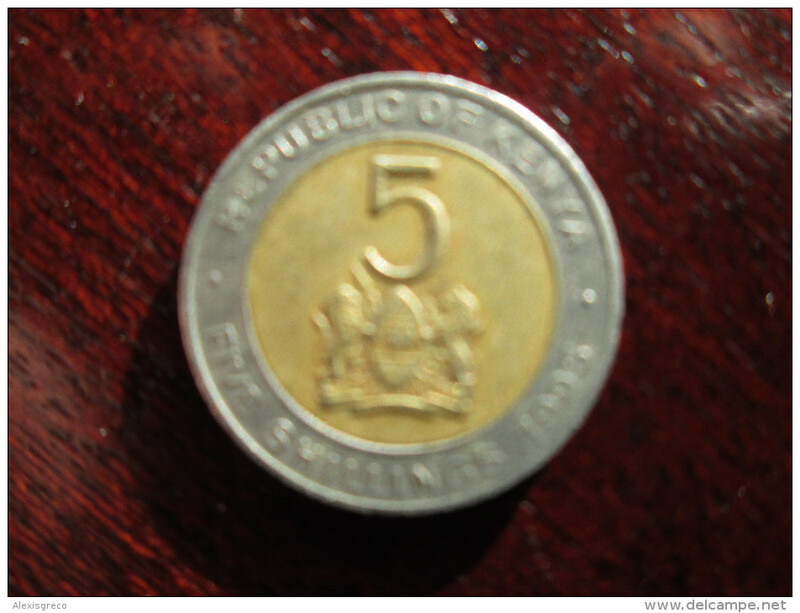 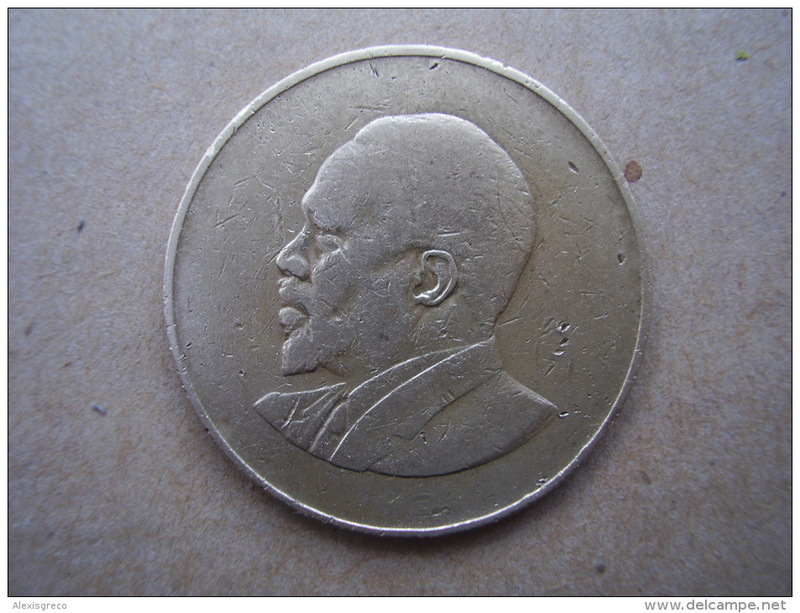 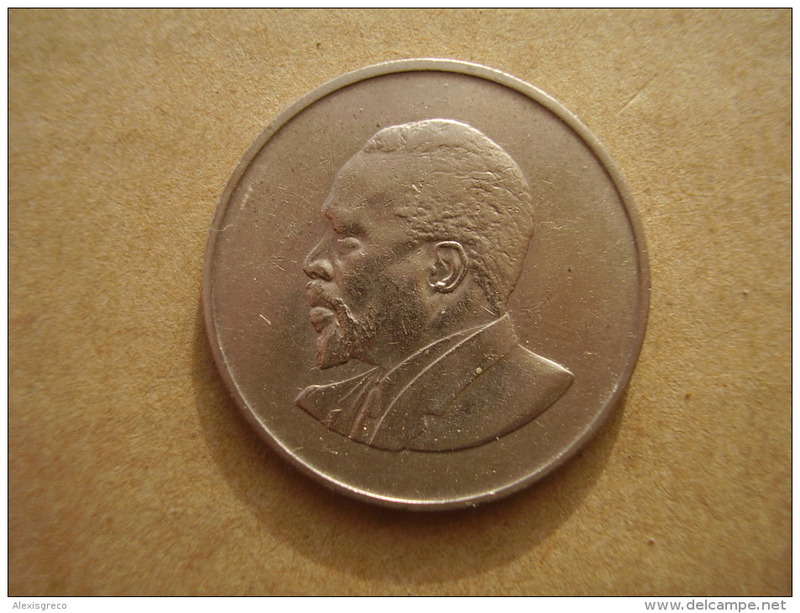 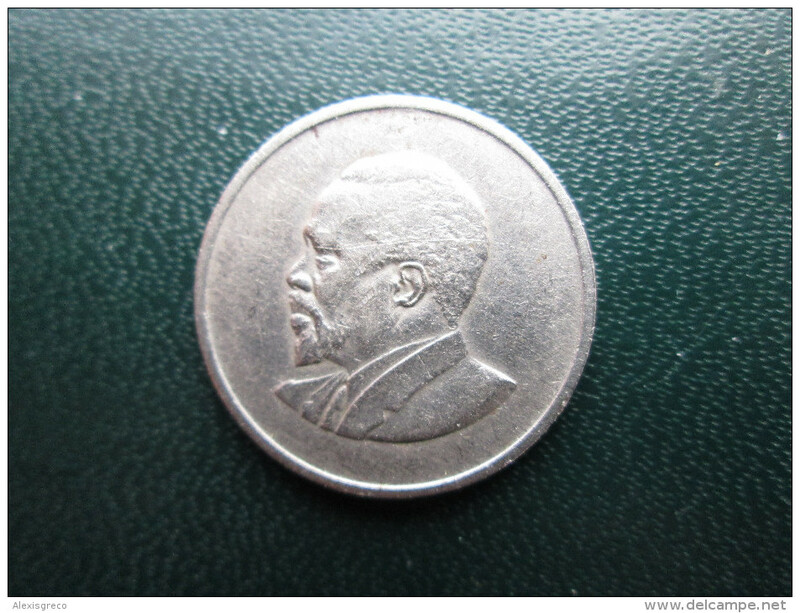 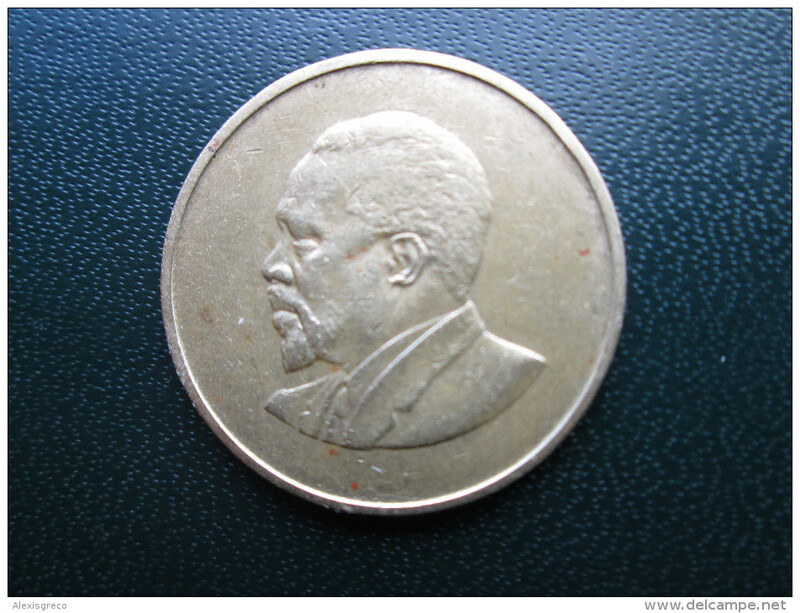 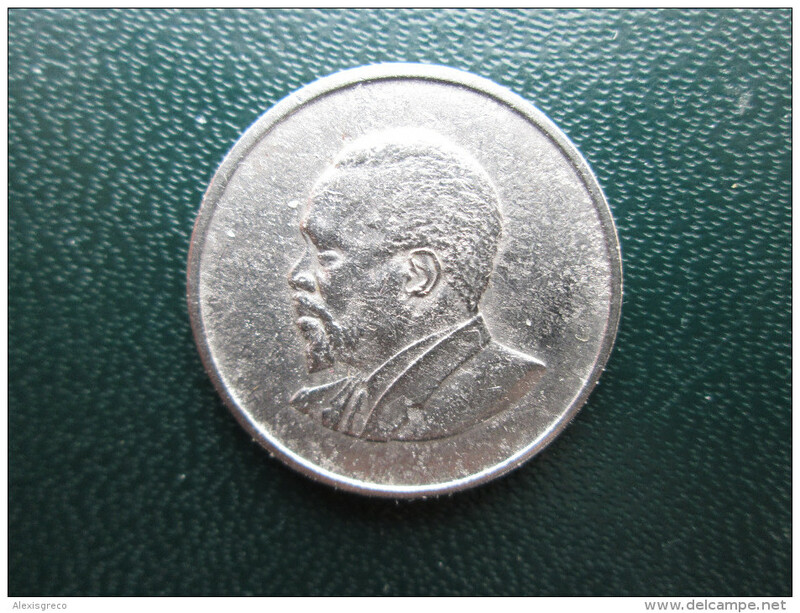 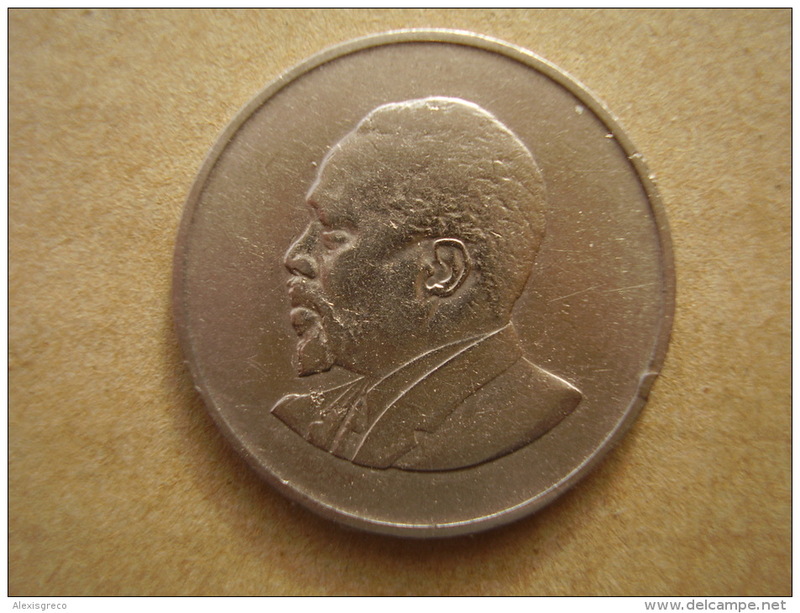 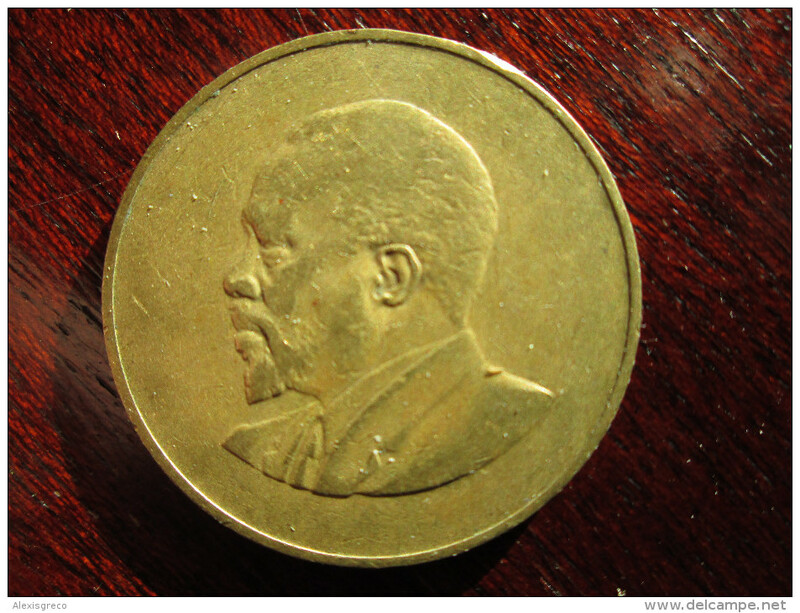 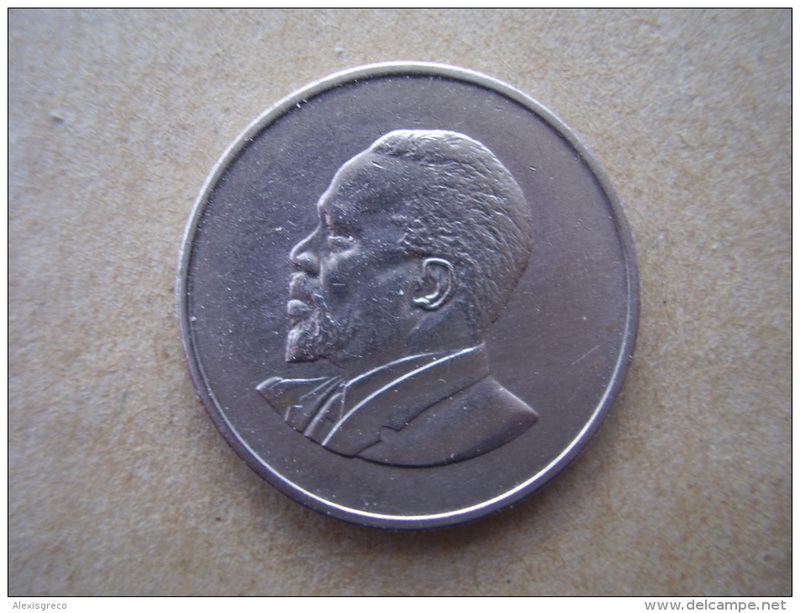 KENYA 1971 FIVE CENTS KENYATTA Nickel-Brass USED COIN in UNCIRCULATED CONDITION. 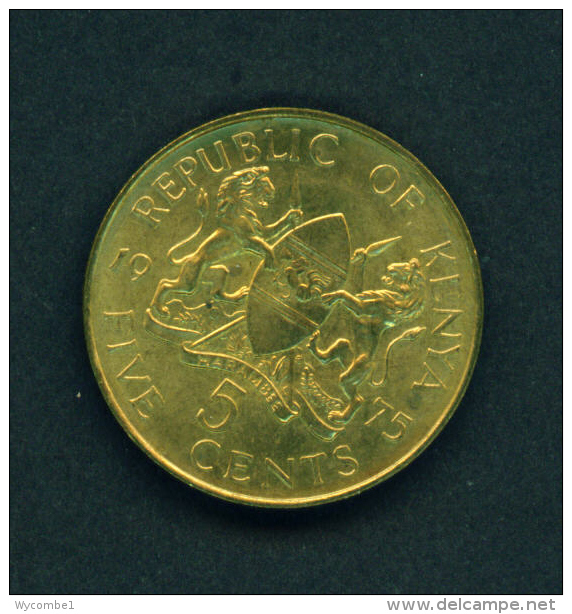 KENYA - 1975 1s Circ. 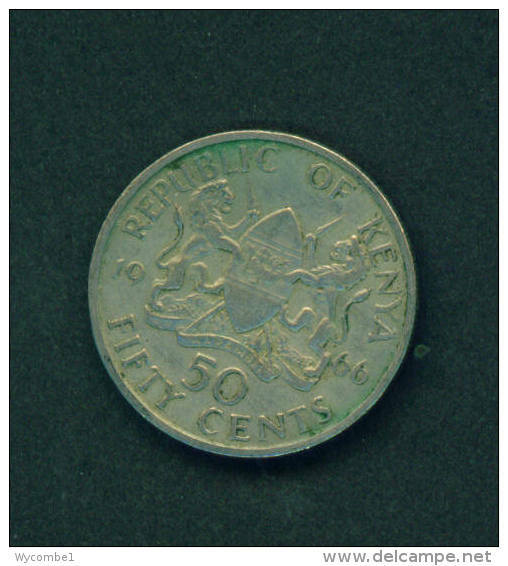 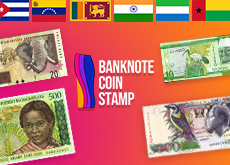 KENYA - 1966 50c Circ. 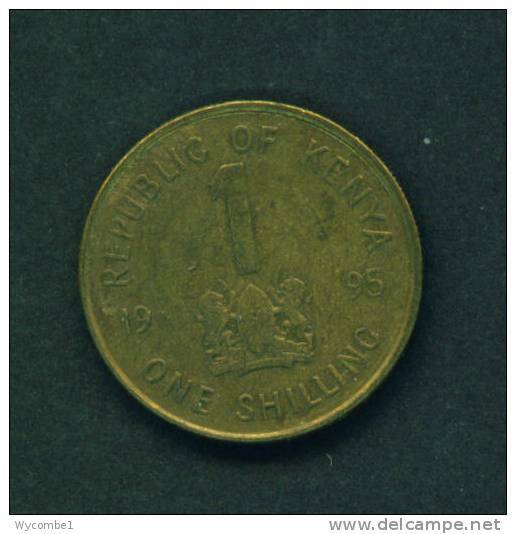 KENYA - 1980 1s Circ. 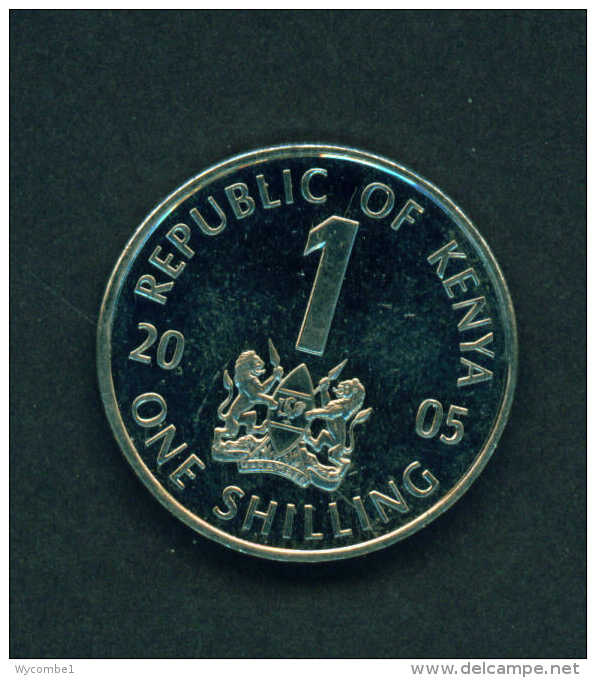 KENYA - 2005 1s Circ. 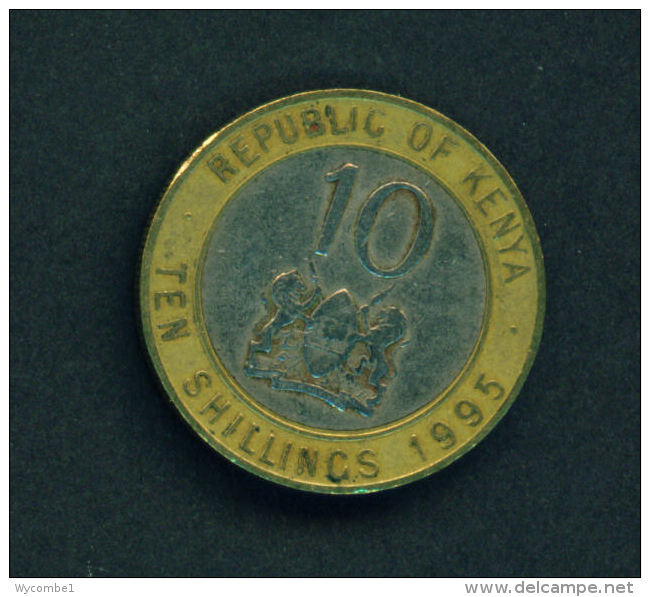 KENYA - 1995 10s Circ. 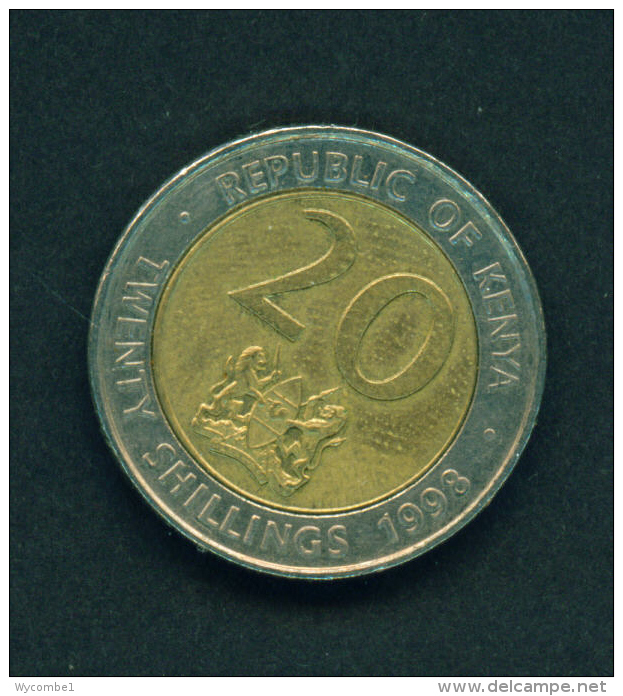 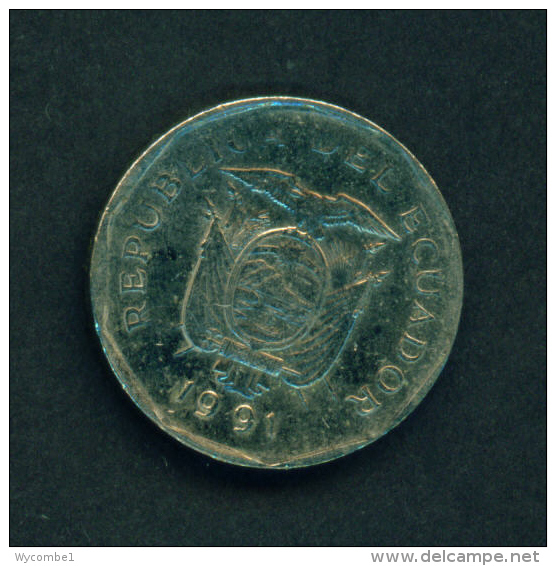 KENYA - 1997 5s Circ. 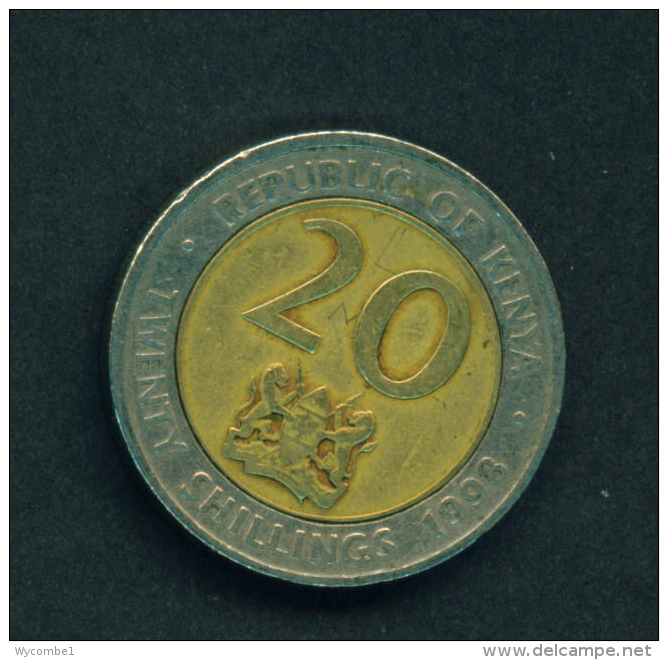 KENYA - 1998 20s Circ. 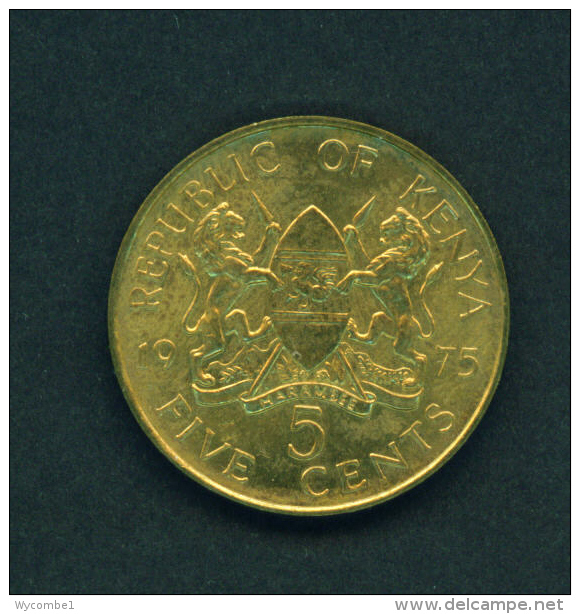 KENYA - 1978 50c Circ. 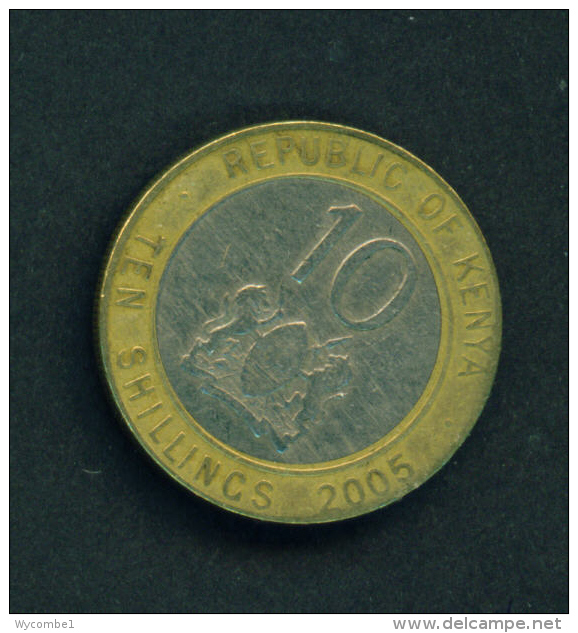 KENYA - 2005 10s Circ. 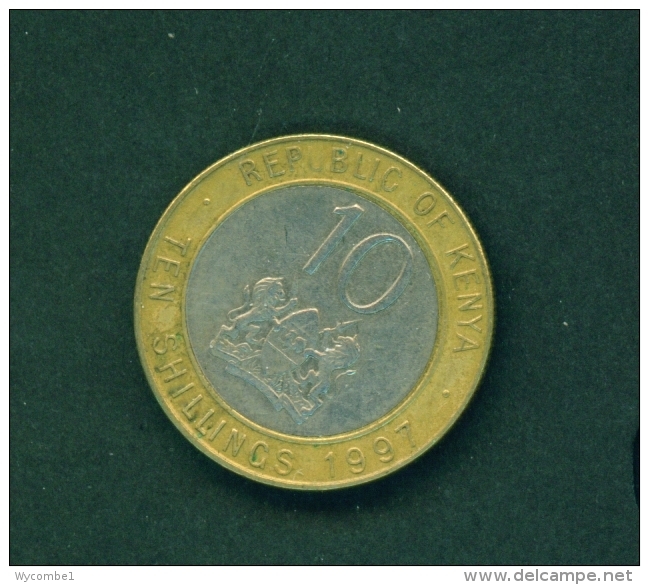 KENYA - 1997 10s Circ. 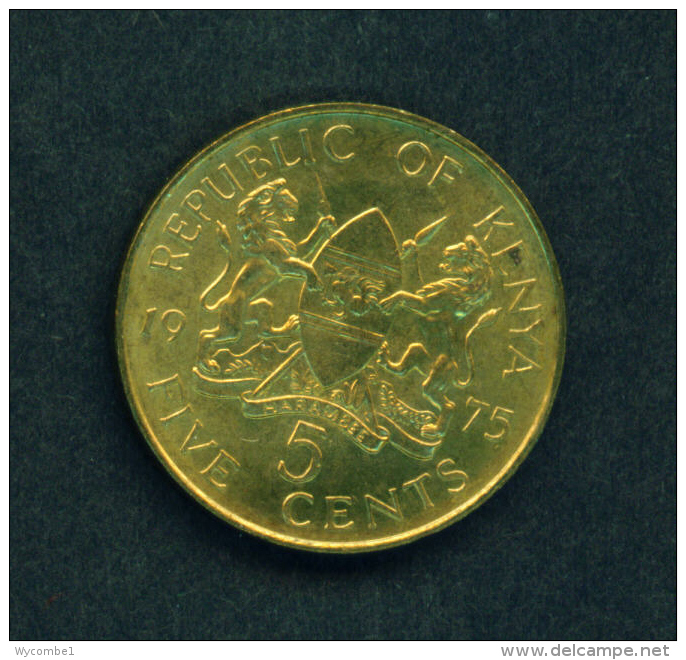 KENYA - 1980 50c Circ. 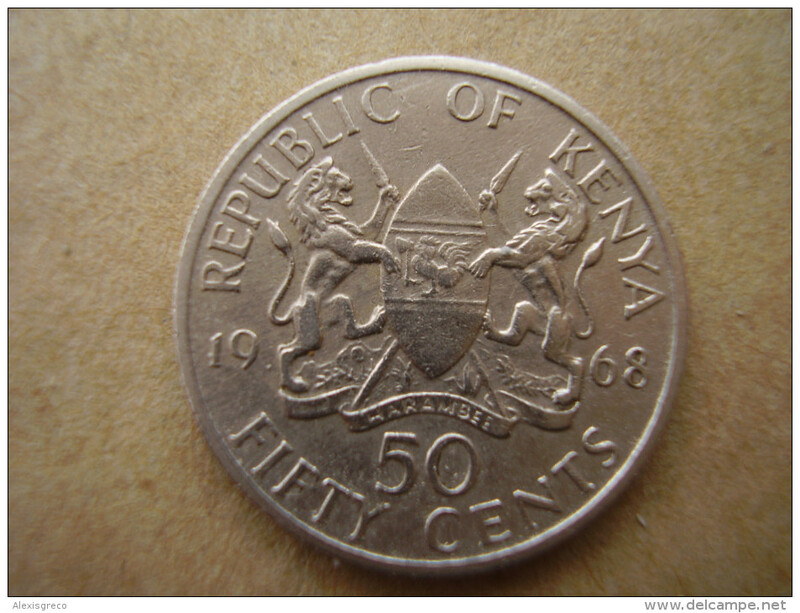 KENYA - 1967 50c Circ. 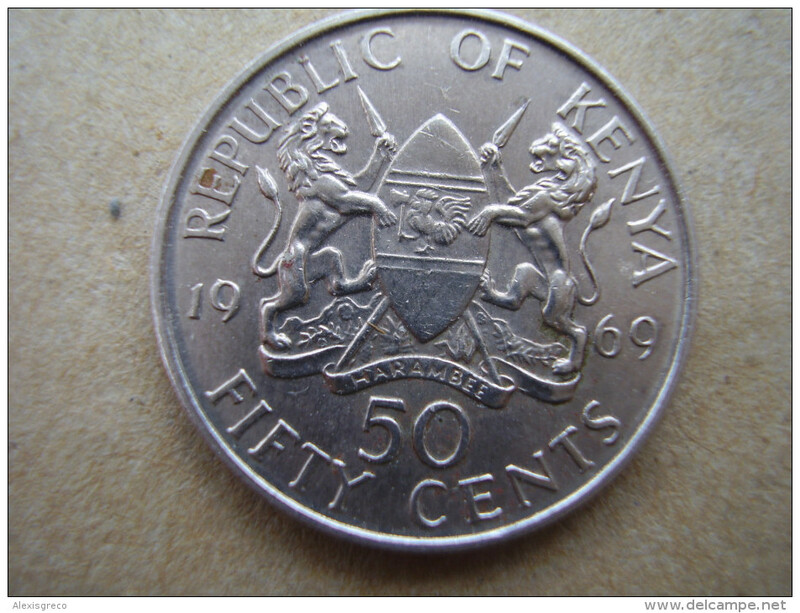 KENYA - 1973 50c Circ. 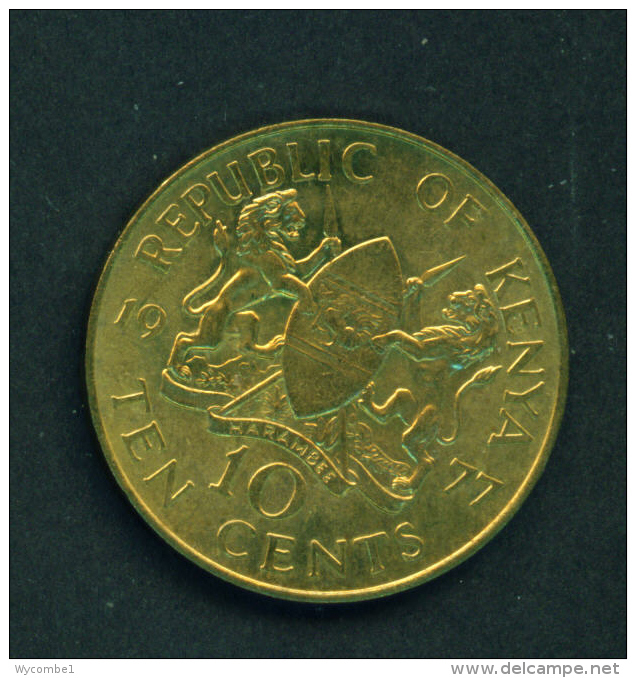 KENYA - 1978 1s Circ. 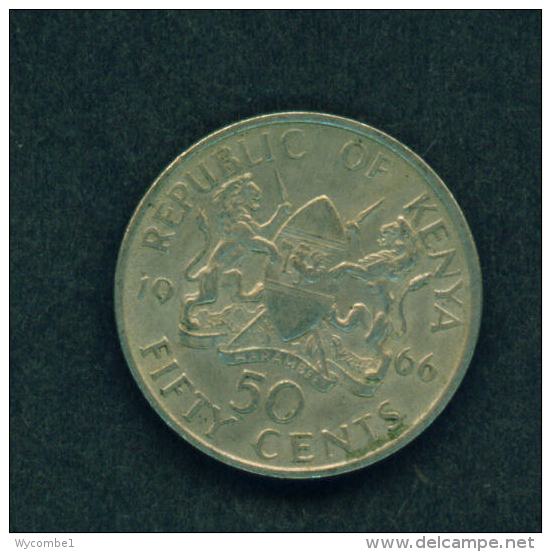 KENYA - 1968 50c Circ. 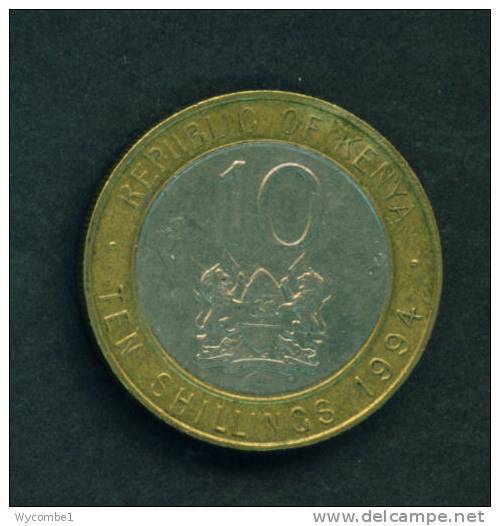 KENYA - 1994 10s Circ.